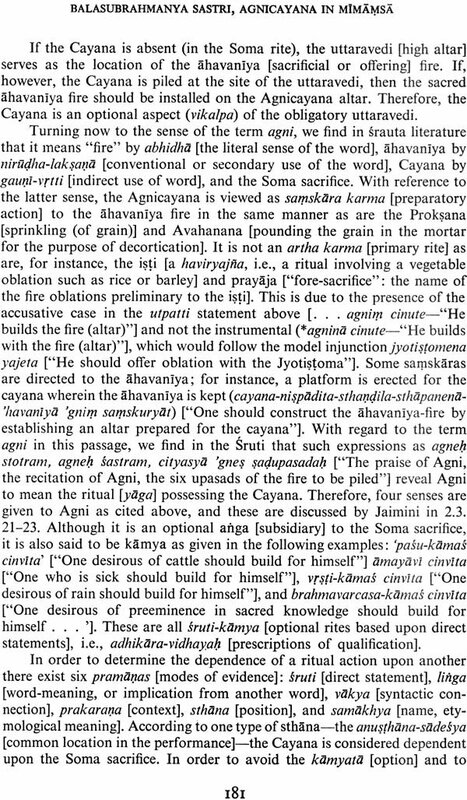 The first volume of Agni: The Vedic Ritual of the Fire Altar contains a discussion of the place of the Agnicayana in the Vedic srauta tradition, its textual loci, traditional and modern interpretations of its origins and significance and an overview of the Nambudiri Vedic tradition. The bulk of the volume, written in close collaboration with C.V. Somayajipad and M. Itti Ravi Nambudiri, is devoted to a detailed description of the 1975 twelve-day performance, richly illustrated with tipped-in photographs, mostly in colour and almost all by Adelaide de Menil. There are numerous text illustrations, tables and maps. 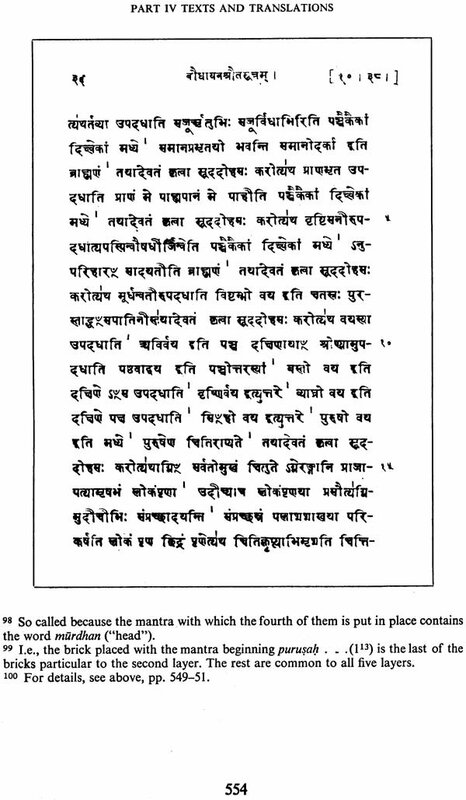 The mantras are published in Devanagari and translation. The second volume, edited with the assistance of Pamela MacFarland, contains contributions by an international galaxy of scholars on archeology, the pre-Vedic Indian background, geometry, ritual vessels, music, Mudras, Mimamsa, a survey of Srauta traditions in recent times, the influence of Vedic ritual in the Homa traditions of Indonesia, Tibet, China, Japan and related topics. 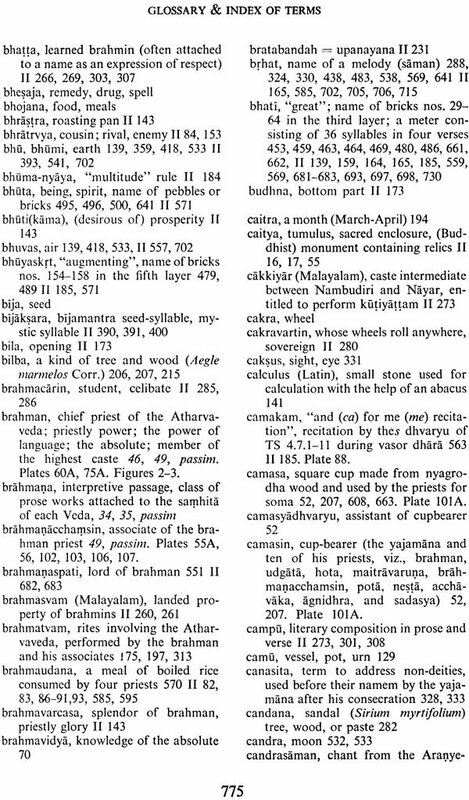 There are translations of the relevant Srauta Sutras of Baudhyayana (together with Caland's text) and the Jaiminiya (with Bhavatrata's commentary) as well as the Kausitaki Brahmana; and a survey of the project with an inventory of the films and tape recordings made in 1975. Frits Staal, Professor Emeritus of Philosophy and South Asian Studies at the University of California, Berkeley, studied at the Universities of Amsterdam and Madras (Ph.D.), as well as Banaras Hindu University. He taught at Amsterdam, London, MIT and elsewhere before joining the Berkeley faculty in 1968. He is the author of 14 books on Nambudiri Veda Recitation, Indian Philosophy, Logic and Linguistics, Sanskrit Grammar, Ritual, Mantras and the Human Sciences; more than 125 articles and two films, one (with Robert Gardner) on the 1975 Agnicayana performance entitled "Altar of Fire" which is now available in video-format from Mystic Fire, New York. Due to the energetic perseverance of Professor Staal... he succeeded in fully recording one of the most complicated Vedic rituals, that of he Fire Altar. The present work gives a complete record of this ritual according to the interpretations of the ancient manuals current among the Nambudiri Brahmin community. 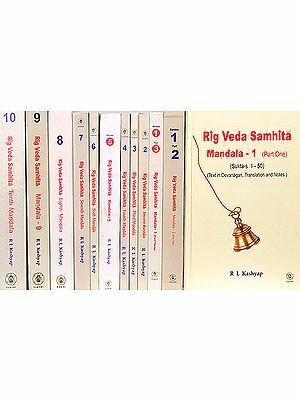 Apart from the unique documentary value of this venture, Agni points to new ways of looking at and studying the Veda and its ritual, as well as its transmission over the centuries. 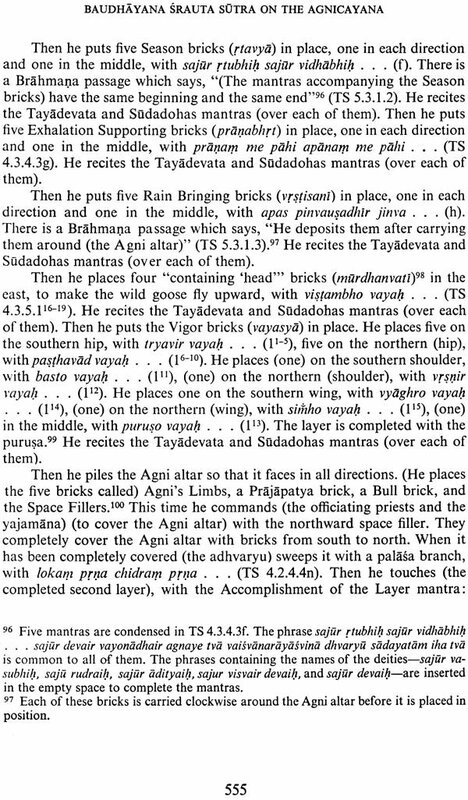 Almost immediately after the completion of this historic Atiratra-Agnicayana, an eagle flew over the ritual enclosure and an hour later, the first monsoon rains came pouring down. In ancient India these were auspicious signs that guaranteed that the sacrifice was successful. Today there is no need for such signs. For future generations will look with admiration on what has been achieved here. With this epoch-making initiative, Frits Staal and his collaborators have earned the gratitude of the history of civilization. All of us, Indologists, historians of religion or of culture, ethonologists, and linguists, are indebted to Frits Staal for his decades of inspired studies among his Nambudiri friends. With Agni, a work of surpassing beauty and intelligence, he has joined a scholarly lineage established by Albrecht Weber four generations ago, a sakha dedicated to advancing our understanding of the Vedic ritual heritage and its civilizational matrix. IN 1955 I VISITED for the first time a traditional Nambudiri Brahmin home in a small village in southwest India. We sat on the verandah, which was spotlessly clean. Hospitality is a virtue common all over Asia, but my hosts' generosity was overwhelming. Delicious vegetarian dishes were served by the eldest son-mounds of rice surrounded by preparations made from a variety of vegetables, spices, pickles, and fruits, among which I recognized cocoanut, ginger, mango, and banana. I ate all these from a banana leaf on the floor by myself, watched with undisguised curiosity by the male members of the family. Earlier, I had bathed in a corner of the garden where numerous buckets of water were made available. These were followed by a towel and a mundu, the garment of unbleached cotton that the Malabar District Gazetteer describes as "a white cloth tied round the waist, tucked in on the right side, and hanging loose to the ground." I sometimes saw women's eyes through a window; more rarely, an elephant in the compound. At that time, though a student of the Vedanta, or "End of the Vedas," I knew little about the Vedas. I considered them ancient and distant, and it would hardly have occurred to me to connect them with my charming hosts. As it turned out, they spent most of their time bathing or engaged in Vedic ritual when I was not sharing their company. During my second visit I was armed with a tape recorder, an upright Philips machine of ample weight and dimensions, which Professor van Buitenen had used in Poona, and which belonged to the Netherlands Organization for Pure Research (Z.W.O.). My heart sank whenever a little boy carried it on his head across a river. I recorded Kathakali and other Malayalam songs, a concerto by a famous singer, and increasing amounts of Vedic re- citation and chant. 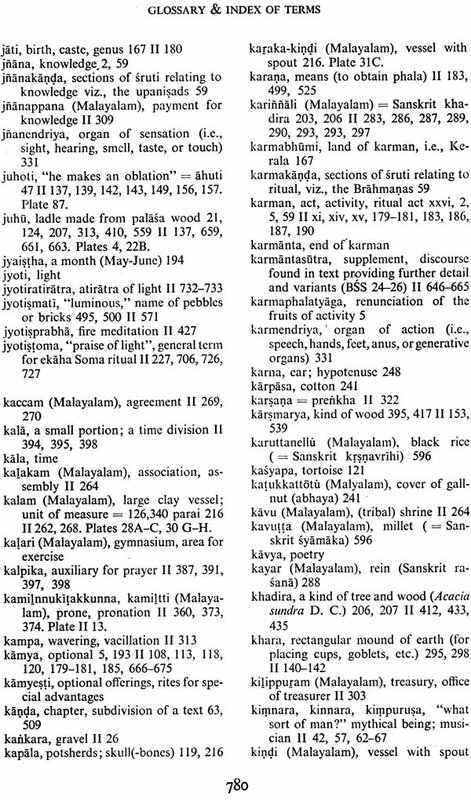 One result of these early researches was my book Nambudiri Veda Recitation, published in 1961. Visits to Kerala of irregular duration followed in more rapid succession. In 1962 I was accompanied by J. E. B. Gray of the School of Oriental and African Studies. We made complete recordings, lasting some thirty hours, of the Rgveda recitations, Samaveda chants, and Yajurveda formulas that accompany the Agnistoma, a ritual celebration that lasts five days. We did not witness any such ritual. The Brahmins recited and chanted for our tape recorder, and the occasion was to them like a general rehearsal. We tried to gain access to a real performance, but none was at hand, and we would not have been allowed in any case. One Nambudiri offered to organize a faithful imitation of the ceremony, to be performed for our sakes, but we declined. In the sixties, some leading Nambudiris became concerned about the weakening and possible disappearance of their Vedic traditions. At the same time I began to urge that their largest ceremony, the twelve-day Atiratra- Agnicayana, which had occurred in 1956 and had never been witnessed by outsiders, should be performed once more so that it could be filmed and recorded. After years of intermittent discussion, in which Professor EUR. Sreekrishna Sarma and Dr. Asko Parpola participated, the Nambudiris agreed. They asked only that in exchange for being given the privilege of attending, filming, and recording the performance, scholars help defray the cost of the ritual. 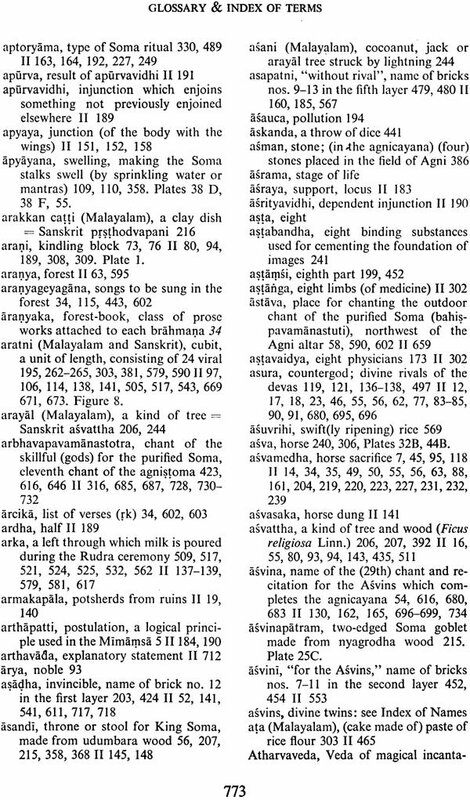 The Agnicayana was performed from April 12 to 24, 1975. The circumstances that led to this performance are related in greater detail in the second volume of this book ("The Agnicayana Project": Part III, pages 456-475). Over the decades, while I was beginning to penetrate the riches of their Vedic heritage, I made many Nambudiri friends and came to know them better. I found them sincere, straightforward, and disinclined to take them- selves too seriously. After initial reluctance, they are eager to explain the intricacies of their recitations, chants, and ceremonies; they never claim knowledge they don't really possess; they will not preach or become pompous, and express no interest in coming to America. Though no longer adverse to modernization, they remain attached to their simple habits. Stripped of former privileges, they have preserved their ability to practice the art of living. This book is offered to them with the wish that material progress will not destroy that rare ability. 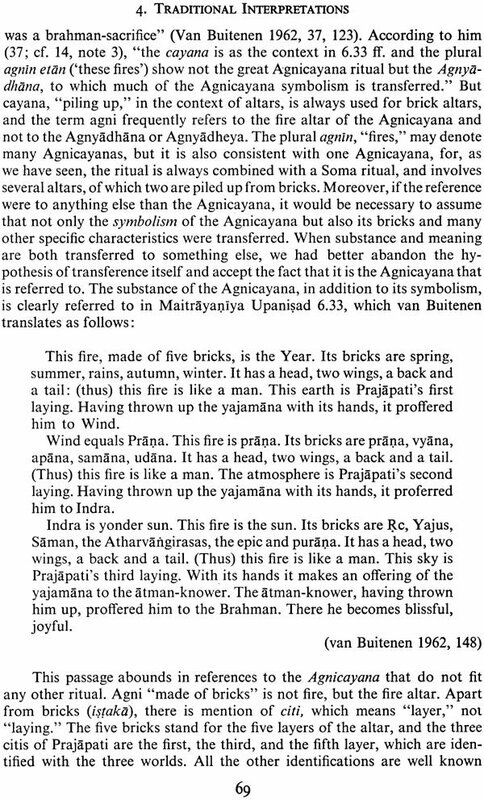 Agni is not only fire and the name of a God, but also the name of the Agnicayana ceremony itself, and the name of the bird-shaped altar constructed during that ceremony. 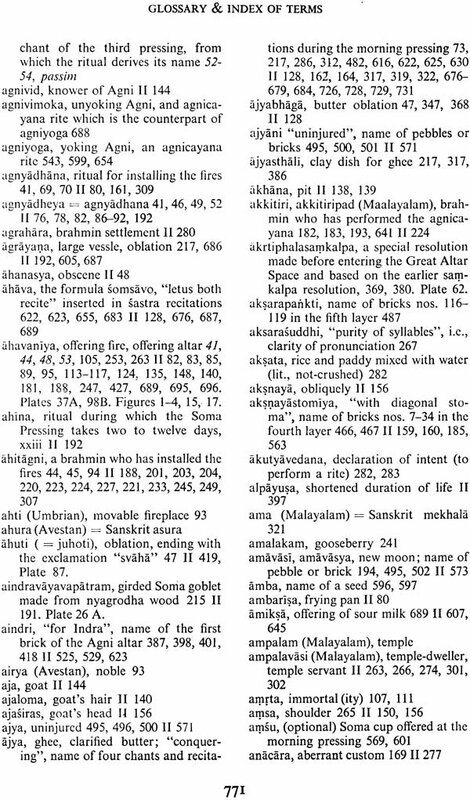 This book deals with Agni in all these forms. It is not a book primarily made from books, but derives, in the first place, from my Nambudiri friends. It would be difficult to list all those who have helped to make it possible over the years. The expertise described in the following pages is extensive and varied, and is embodied in a sizable section of the community. 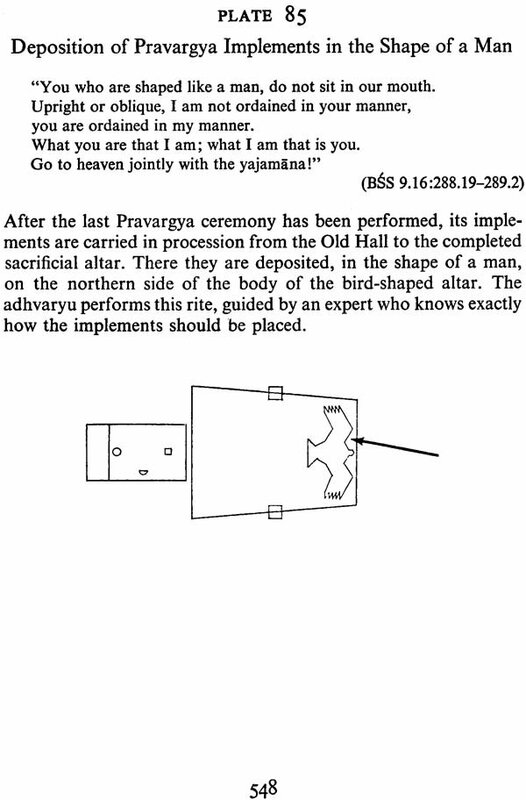 For example, in the course of the long Agnicayana ceremony, the ritual implements of another rite (the pastoral Pravargya) have to be put on the altar in the shape of a man. One person knew precisely how this should be done. When the chief priest was about to perform the rite, PLATE 85 he appeared and demonstrated it. Without being able to thank all, let me pay tribute to four Nambudiris upon whom I have always relied and who, at the time of writing, are in their seventies. Two of them have directly collaborated with me in the present volume, especially in its Part II: Cherumukku (Cerumukku) Vaidikan Vallabhan Somayajipad and Muttatukkattu Itti Ravi Nambudiri. Cherumukku Vaidikan, or C.V. as he is respectfully called, occupies a central position in the ritual realm of the Kg- and Yajurveda. He is the leading force of one of the two Vaidika families who continue to perform the large rituals. He carries his knowledge lightly, but his authority is unquestioned. He has a formidable mind, combined with an efficiency that is rare. He arranged for the Agnistoma recordings of 1962, and when the preparations for the 1975 performance (originally planned for 1974) were about to collapse, the situation could only be saved-and was saved-through his power and decisive action. Itti Ravi, as he is affectionately called, is the undisputed master of the Jaiminiya Samaveda, the school of Samaveda that survives primarily among the Nambudiris. He has devoted his life to the maintenance of the tradition of these chants: he reconstructed from his memory, with the help of his pupils, those that were on the verge of being forgotten, had them recorded whenever there was an opportunity, and committed them to writing. Thanks to his constant activity the materials are now at hand, and the only unpublished school of the Vedas is ready for publication. It was my good fortune to meet Itti Ravi during my first visit to Kerala. Ever since, I have learned and recorded from him. The extent of his knowledge is as phenomenal as the length of his breath. One of my oldest friends is Matampu Narayanan Nambudiri, B.A., and B.L. After early training in his native Yajurveda, he took to the study of law and became an advocate. Like C.V. and Itti Ravi, he was politically active and took part in the Nambudiri Yogaksema Mahasabha, an organization concerned with the modernization of the Nambudiri caste system. Since he was opposed to animal sacrifice and refused to attend rites that involved such sacrifice, the 1975 performance was the first of its kind that he witnessed. His Gandhian attitude did not diminish his enthusiasm for Vedic culture, and this zeal, combined with a modern outlook, made him a valuable ally in bridging the gaps between my plans and reality, and between sometimes opposing factions. The doyen of Nambudiri scholars is Erkkara Raman Nambudiri. In 1966, he recited the Kausitaki Brahmana for its editor, E. R. Sreekrishna Sarma. In 1976 his book Amnayamathanam, "The Kindling of Tradition," was published in Malayalam. Another book on ekaha, ahina, and sattra is about to appear. As long as Erkkara failed to support, for respectable reasons our desire to film a Vedic ritual, there was nothing that could be done out it. However, it is characteristic of him that when he changed his mind and came to feel that there is merit in having on film and tape what otherwise that be irretrievably lost, he also assumed full and active responsibility. In spite of his indifferent health, he consented to be present inside the sacrificial enclosure throughout the ceremonies, so that all could benefit from his knowledge and wide experience. The 1975 performance was organized by Cherumukku Vaidikan and Itti Ravi Nambudiri. Their responsibilities and roles will become apparent in e course of this work. Our collaboration at the writing stage is easily described. 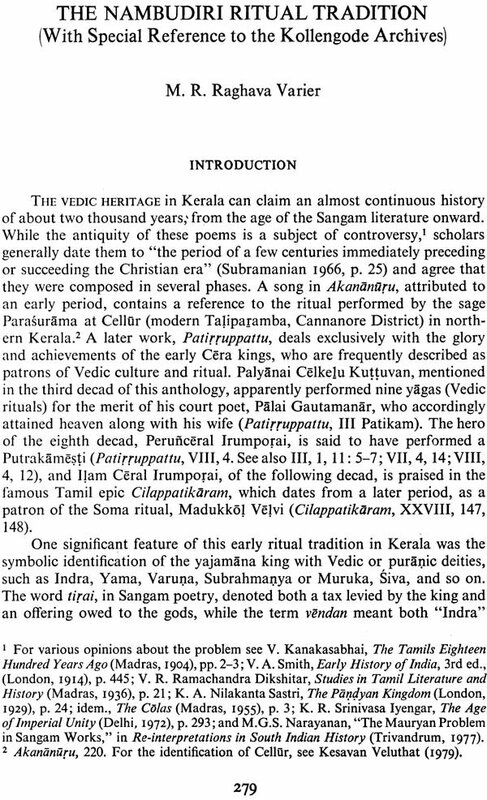 The description of the performance in Part II of the present volume was written in drafts that were separately submitted to C.V. and Itti Ravi for their scrutiny. They then sent me their corrections and additions. Many of these exchanges took place through correspondence, but fortunately I have been able to sit at their feet again in the course of this work, and after the manuscript had begun to take shape. These sessions were not eon- fined to the correction of what I had written. They induced me to reorganize the material so as to express its structure more clearly, and to incorporate new facts and insights. 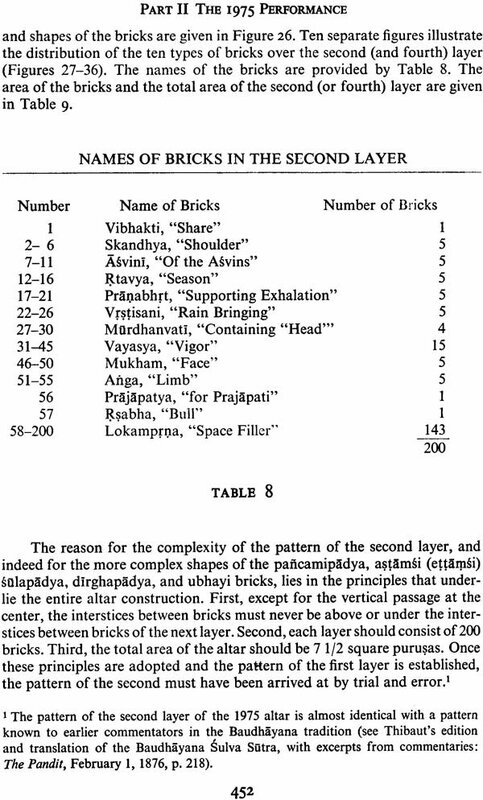 For example, much of the information on measurements and the ritual enclosure in the "Preliminaries" (Part II) derives from days spent with Itti Ravi in 1977. Late in 1978, the Smithsonian Institution enabled me to go to India once more and to consult with my collaborators for the last time before the manuscript would be completed. Some of the additional results of this trip are presented in three chapters of Part III (in the second volume). As a result of our close and extended collaboration I can now assert with confidence, that Part II of the book exhibits a major part of C.V.'s and ltd Ravi's combined knowledge of the ritual. The occurrence of their names on the title page is therefore not merely decorative. At the same time, I alone am responsible for mistakes that remain. My indebtedness to others, hardly less numerous, is for support that has also been indispensable. When the Nambudiris had decided to permit the performance to be studied and documented, an international committee was set up, consisting of Professors R. N. Dandekar and C. G. Kashikar (Poona), Klaus Mylius (Leipzig), Asko Parpola (Helsinki), V. Raghavan (Madras), F. R. Sreekrishna Sarma (Tirupati), J. A. B. van Buitenen (Chicago), and myself as chairman. Dr. Parpola initiated the correspondence, which soon grew into formidable proportions. We invoked the assistance of Vedic scholars all over the world, and the response was invariably positive. Among the enthusiastic supporters was Dr. Pierre Rolland, whose tragic and untimely death occurred in 1974. The first preparations began to take shape. 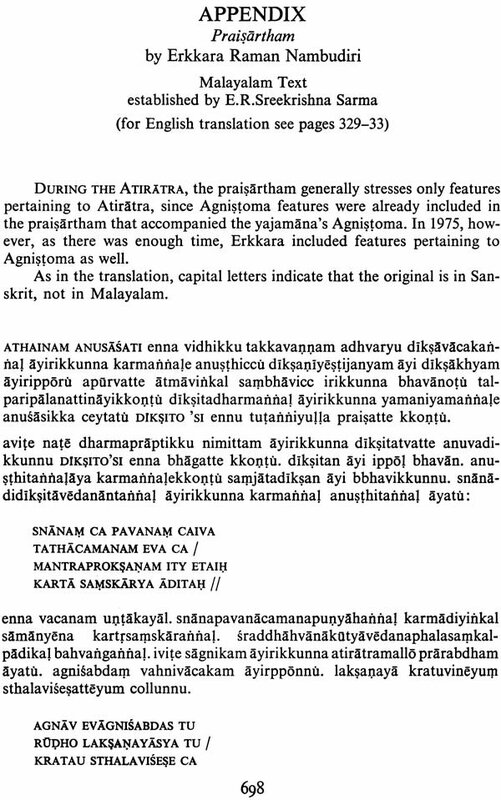 Dr. Kashikar provided a 30- page description of the Agnicayana, based upon srauta sutras, sulba sutras, and prayogas. 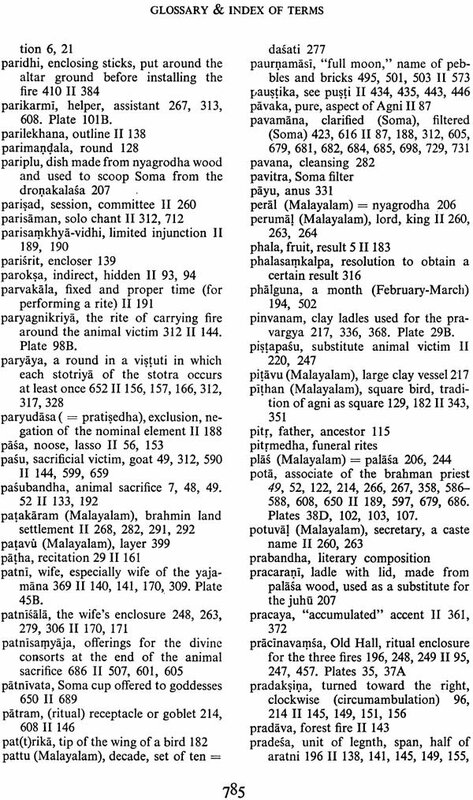 Dr. Parpola provided a list of the saman chants from Jaiminiya sources, which was later supplemented and extended by Itti Ravi. 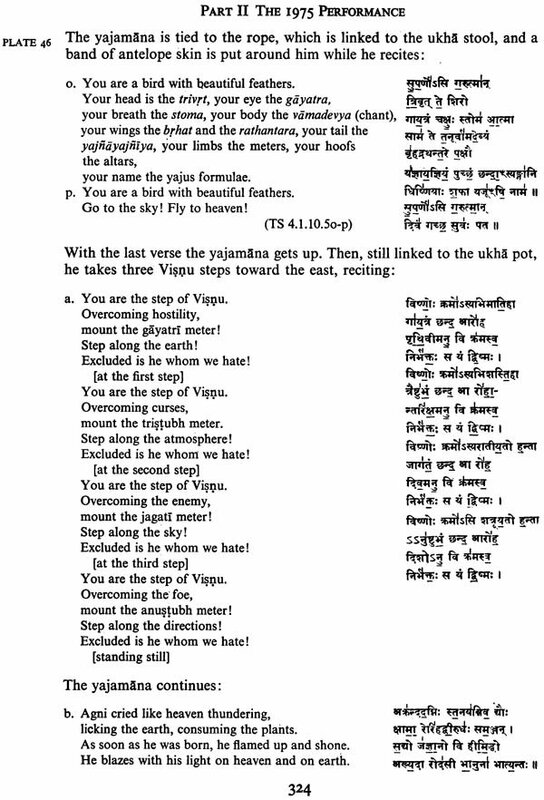 Cherumukku Vaidikan gave an oral description, in Malayalam, of the sequence of rites to Professor Sreekrishna Sarma, who translated this into English in a pamphlet of 21 pages. Professor J. C. Heesterman from Leiden visited Berkeley during January-March, 1975, lectured on the Agnicayana section (Chapter 10) of Baudhayana Srauta Sutra, and helped me to prepare a booklet of instructions for the cameramen. Mr. J. E. B. Gray, London, prepared from our recordings a full transcript of the recitations of the Soma-pressing day. I wrote a general pamphlet-on the study of Vedic ritual, to be used in approaching foundations. I felt strongly that the filming and recording should not be done by Sanskrit scholars, but be in professional hands. Thus started the research for technical assistance and, at the same time, financial support. I have always hated begging for money, which has become a very time-consuming part of all large scholarly projects. Financial support was particularly hard to obtain in the seventies for projects that were not fashionable, or were considered to lack practical utility or "relevance." Operating from Berkeley-with the advice and assistance of Dr. Mark Juergensmeyer, and with the help of the administrative staff of the Center and the Department of South and Southeast Asian Studies-I approached numerous foundations and individuals, generally without tangible result. Fortunately, we were assisted not only by the members of the executive committee, but also by other scholars from all over the world. I should like in particular to mention the active participation of Professors A. Scharpe (Belgium), C. von Furer-Haimendorf and J. E. B. Gray (England), N. Nakada and N. Tsuji (Japan), J. Gonda and J. C. Heesterman (Netherlands), T. Asch and E. C. Dimock (U.S.A)., and W. Rau (West Germany). I am especially indebted to the Smithsonian Institution, The Rock Foundation, and the National Endowment for the Humanities, not only because their contributions were the largest, but also because they sustained their interest in the project and continued to support us on later occasions. In the meantime, the Government of India had been approached through the Indian Consulate-General in San Francisco, the Indian Embassy in Washington, Dr. Dandekar and Dr. Raghavan. Following the enthusiastic support of Dr. Kapila Vatsyayan, the Government of India expressed great interest in the project and agreed to provide the necessary permissions and facilitate the importation of equipment. The rupee grant from the Smithsonian Institution, authorized by the Government of India, was administered through the American Institute of Indian Studies. Mr. P. R. Mehendiratta of the Institute put all the facilities of his office at our disposal and helped with the administration of the project, its financial implementation, and the processing of numerous documents. His participation in the project started in 1974, and he continued to provide background support from New Delhi throughout the actual performance. A detailed financial report on the rupee grant was prepared at his Delhi office. Some information on our budgets will be provided in the account of "The Agnicayana Project" in the second volume. Late in 1974, I secured the participation of Professor Robert Gardner of the Department of Visual and Environmental Studies, Harvard University. Henceforward the direction of films and still photography, and indeed the supervision of the entire visual and sound effort, was in his hands. Gardner and I visited Kerala in December 1974, made the final arrangements, concluded agreements with the performers, and initiated a period of active consultation and cooperation that continued without interruption for the next four months. When the performance started on April 12, 1975, I began to realize that there were many basic things I did not know. I came to understand only then what is meant when we say that ritual is "activity" (karman). Ritual is not a thing that can be easily understood if one only has access to texts. More importantly, whatever texts may say, language does not explain such activity. It is we who ask for explanations in terms of linguistic expressions. For the ritualists, action comes first, and action, which includes recitation and chant, is all that counts. Now, however, a curious convergence became apparent, for the same holds for cameramen, photographers, and sound engineers. 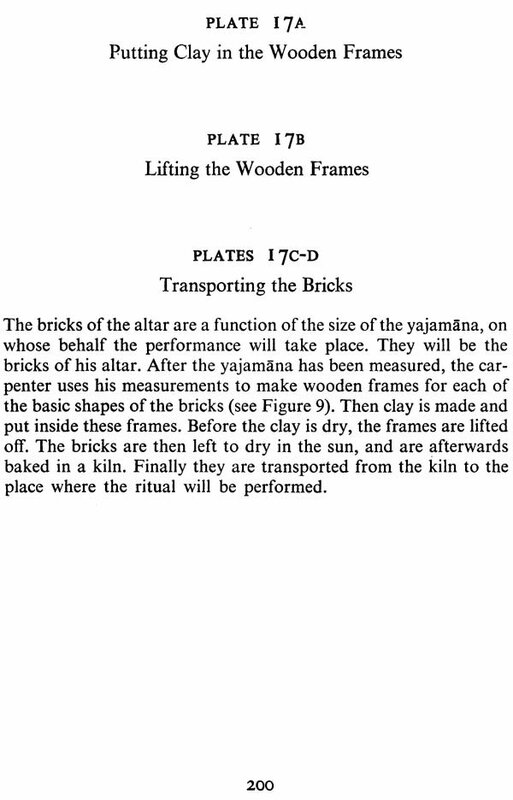 Textual scholars will find it hard to understand how much I learned about Vedic ritual by seeing how Robert Gardner, who until then had known nothing about it, set about to film it. Despite the time we had spent preparing for the event, the rites generally took me by surprise. We could not enter the ritual enclosure, and it was not always possible to see clearly. Earphones enabled me to hear what was going on inside while it was being recorded on tape. All in all, I was often lost. In confusion, I would look for Gardner, who was always where the action was, filming it with his assistants there, while Adelaide deMenil was doing the still photography. I am grateful to them, therefore, not only for providing massive documentation, but also for making me see. While most of the films were shot by Gardner and Kevin Burke, they were assisted for sound by Kunju Vasudevan Nambudiripad and Professor M. Narayanan Nambudiripad, who, unlike all non-Nambudiris, could enter the enclosure. The film crew consisted, in addition, of Mankada Ravi Varma and Sarwesh Kumar, Most of the still photographs were taken by Adelaide deMenil, and a fair number by Dr. Parpola and Dr. Ikari. Professor Edmund Carpenter assisted with the technical organization, made sketches and measurements of sacrificial implements, and collected information of various kinds. Professors N. A. Jairazbhoy, F. Carpenter, and myself were in charge of the sound recordings, sometimes helped by other visitors, e.g., Dr. Romila Thapar. More detailed information about our equipment and mode of operation will be provided in the second volume. We returned with almost 80 hours of recorded tape, 20 hours of color film, more than 4,000 still photographs (color and black/white), a set of sacrificial implements (now in my Berkeley office), and abundant notes, sketches, and drawings. The first need was for an inventory of these materials. Back in Berkeley I began with the 20 hours of film. I had access to a balky Moviola editing console for less than a month, and prepared 78 pages of tentative annotations with the assistance of Harold Arnold, my wife Saraswathy, and (for the Pravargya) Wayne Surdam. The first draft of the annotations was completed by August, 1975, and an abridged outline is published below (Part V, in the second volume). These annotations were used in preparing the 45-minute film "Altar of Fire," produced by Robert Gardner and myself and released early in 1977. In the meantime I also learned to find my way in the mass of tapes and photographs, though until now there has not been sufficient time to prepare a proper catalogue. The way was now paved for writing up the results. During 1976-1977, this work was made possible through the assistance of a research grant from the National Endowment for the Humanities. 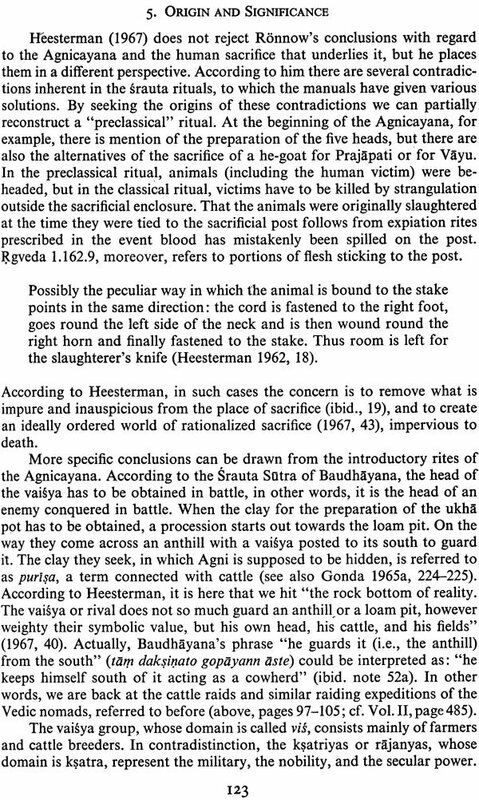 I started with an analysis of the background, which resulted in Part I of the present volume ("The Agnicayana Ritual"). In this part, limited use is made of the data collected in India. Though my primary inclination is to work in the field, this first part could not have been written had I not been in residence at Berkeley. Our Berkeley Campus not only provides incessant intellectual stimulation, but its athletic facilities preserved my ability to transport books, films, and tapes, and prevented me from getting stiff when spending long hours at my desk. Also Berkeley still houses some of those almost legendary scholars who combine insight with the unfailing control over large masses of facts. A telephone conversation with Edward Schafer, for example, provides precise answers to numerous questions in a matter of minutes. Our library would yield such information only m-udng1y and after weeks or months of frustration. I am therefore especially grateful to some of my Berkeley colleagues: Professors Murray B. Emeneau and George L. Hart of South Asian Studies for things Dravidian; J. K. Anderson, Thomas Rosenmeyer, and Michael Naler of Classics for Greek; Leonard Lesko and Martin Schwartz of Near Eastern Studies for Egyptian and Indo-Iranian, respectively; Edward H. Schafer of Oriental Languages and Raymond N. Tang of the East Asiatic Library for Chinese. Robert F. Heizer of Anthropology has taught me most of what I now know about fire by generously providing a pile of off prints. Lewis and Lois Lancaster have helped me with Buddhism and pottery, respectively, and Margaret Lock has assisted me with Shamanism. Ned K. Johnson and his associates at the Museum of Vertebrate Zoology-Mercedes S. Foster and Steve Bailey-have informed me about birds. Joseph H. Peck, Jr., of the Museum of Paleontology, has helped me with fossil ammonites. Richard Reeder of the Department of Geology and Geophysics identified the "chicken-fish" pebbles. From outside the Berkeley campus I also received a great deal of assistance, especially in connection with publications. For this I should like to thank Robert Gardner and his assistant Hope Norwood at Harvard, J. E. B. Gray in London, Jeff Masson in Toronto, Don B. Griffin in Tuscaloosa, and Barbara Miller and Dorothy Norman in New York. My indebtedness to the articles that appear in Part III of the second volume will be apparent at the appropriate place. Special interest attaches to the translation of the 10th chapter of Baudhayana Srauta Sutra by Yasuke Ikari and Harold Arnold in Part IV of the second volume. In preparing the text of Part II, which constitutes the bulk of the first volume, I derived much help from all the articles and documents that had been prepared, and from the numerous Vedic texts and related publications, with which Vedic scholars are already familiar. However, the following description is principally based upon the materials we brought back from India. With the help of my own field notes I went repeatedly through our recordings, films (now available as videotape cassettes), and photographs. 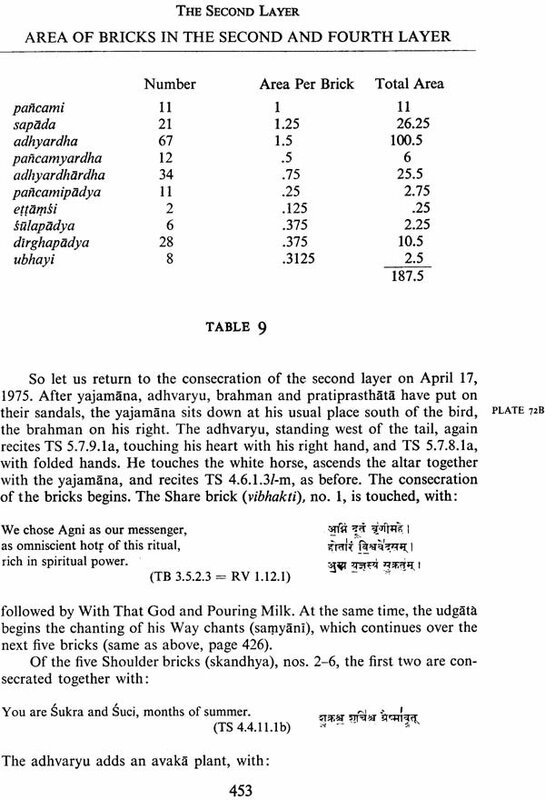 Whenever there was a discrepancy between the ancient texts and our own field data, I recorded the latter, checking explicitly with Cherumukku Vaidikan[or Itti Ravi if' there seemed to be any reason for doubt. The reader should not jump to the conclusion, therefore, that unfamiliar forms are "mistakes," even if elementary rules of the language seem to be disregarded, as for example in agnaye idam na mama, "this is for Agni, not for me" (see below page 47). While the Atiratra-Agnicayana unfolded itself in my mind in all its splendor and perplexity, the manuscript began to grow. Dr.Ruth-Inge Heinze helped me to edit the manuscript and typed large portions of it in exemplary fashion. Ruth Suzuki typed the latter portions with fantastic speed and accuracy. My wife Saraswathy helped me in matters of style. Yvonne Kins, Helen Tu, Keith Jefferds, and Pamela MacFarland assisted in numerous ways, including style, references, and books. Adrienne Morgan prepared the illustrations in the text and the maps-a difficult task that she executed with expertise and imagination, as a glance at Figures 27-36, for example, will show. A difficult dilemma was whether to include in the description of the ritual the text and translation of the numerous recitations and chants. A simple alternative would be to merely refer to them by means of the numerous abbreviations customary among Vedists. It might be argued that, since the participants do not often understand them, it would be best to delete the texts. Be that as it may, they certainly know them. To omit them and confine oneself to references would not only give the book the appearance of a telephone directory, it would also do an injustice to the perfomance, and be useless to nonspecialists. I accordingly decided to provide something, and the next question was whether to provide texts, translations, or both. To omit the original form, which is ritually significant, would almost be sacrilege. 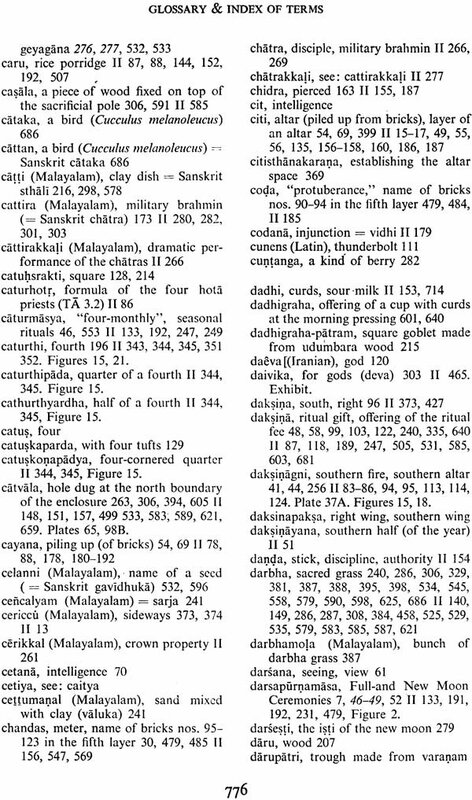 Moreover, most readers, when presented with Sanskrit forms, would want to know their meaning. In the case of many of the chants, and recitations such as the sadasin, "the sixteenth," there is no meaning, and so there was no problem. In the remaining cases, the great majority, I reluctantly decided to provide the text together with a translation into English. In preparing the texts I was helped by Pamela MacFarland, Professors R. N. Dandekar and T. N. Dharmadhikari, Poona, and Professors F.R. Sreekrishna Sarma and S. Sankaranarayanan, Tirupati. In translating the texts I received a great deal of assistance. My first thanks go to Professor Wendy Doniger O'Flaherty, who helped me with translations from the Rgveda. Neither of us is a specialist in Indo-European, one requirement for the traditional Vedic philologist. Both of us feel, however (as she says in the Introduction to her Anthology from the Rgveda: Penguin Classic, 1981) that "there is so much in the Rgveda to interest and excite non-Vedists, it seems a shame to let it go on being the treasure of a tiny, exclusive group, hidden as it is behind the thorny wall of an ancient and cryptic language." The difficulties, however, are formidable: "As a result, there are places where the reader may be puzzled. Good. The hymns are meant to puzzle, to surprise, to trouble the mind; they are often just as puzzling in Sanskrit as they are in English." 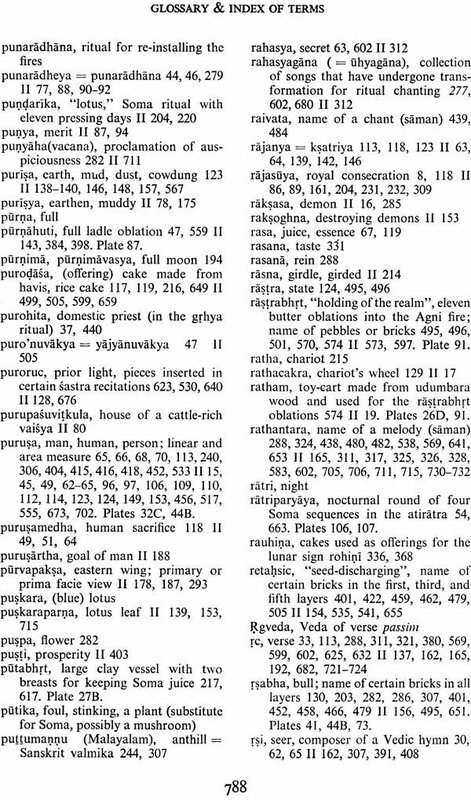 One of the main features of the Atiratra-Agnicayana-its huge dimensions-made itself felt in connection with the translations. Wendy could not cover more than a relatively small portions because of her other commitments and the daunting distance between Berkeley and Chicago. I decided, there fore to follow exiting translations in many cases, even though they are often unsatisfactory. I changed them whenever I felt I knew how they should be changed, and in all cases sought to improve their readability. This applies especially to Keith's translation of the Taittiriya Samhita, which is in biblical English. The Rgveda translation by Geldner is in German and that by Renou, almost complete, in French. Several other texts have been translated by others, and some have remained untranslated. All required a lot of work. 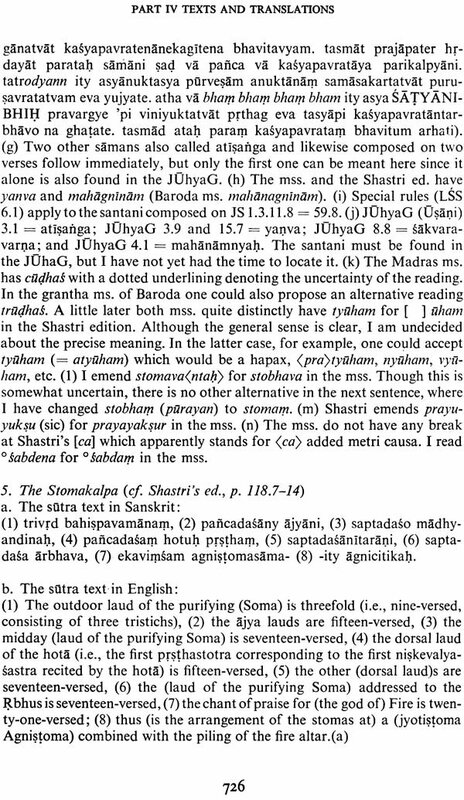 Stanley Insler has also contributed the translation of the text of the first sastra recitation by the hota priest (RV 8.48.3-4; 3.29.8; 2.9.1-2) and the varunapraghasa verses (RV 10.176.2-4; 3.29.4; 6.15.16; 3.29.8; 2.9.1-2) recited by the hota during the Carrying Forth of Agni (Episode 20). Stanley's translation are recognized at a glace: he use "thy," "thou," and "thee," where I would have "you". 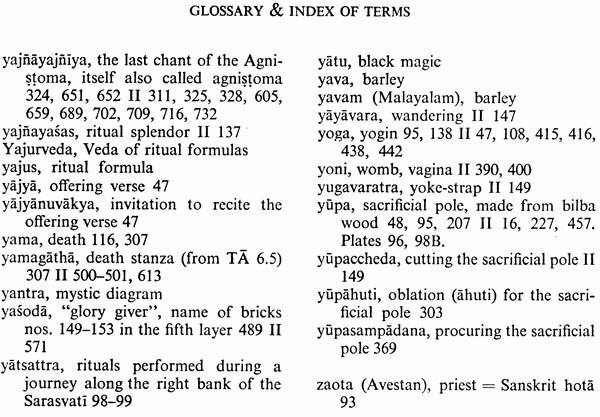 These discrepancies happen to illustrate the gap between Rgveda and Yajurveda, which is of the same order as that between Shakespeare and contemporary American literature. "My colleagues will understand that my renderings ... do not pretend in any way to be definitive. There is hardly a line in the 1gveda which does not present its own problems... It was my intention at least to show what kind of hymns was recited at the ritual and I have hoped for at least a fair approximation of their contents." 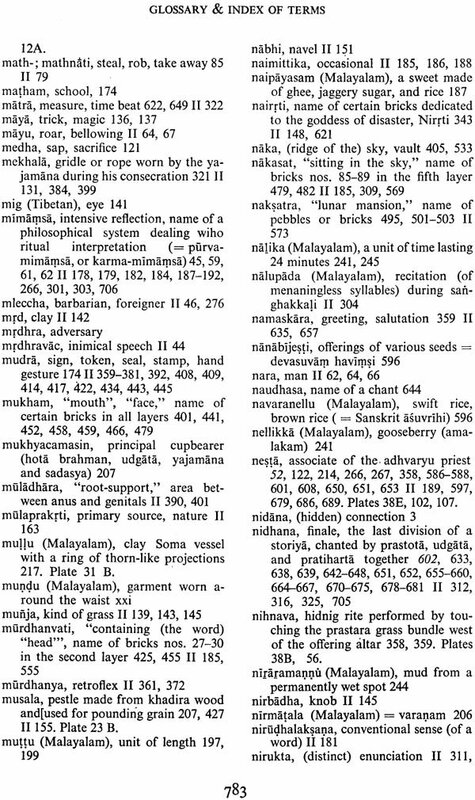 Apart from Vedic Sanskrit, there are a few translations from Malayalam, the native language of the Nambudiris. With respect to these I have been helped most by Professor E.R. Sreekrishna Sarma. He has also established the text and translated the long "Praisartha" addressed to the patron of the ritual on the occasion of his consecration. Dr. N. S. Mooss, Vayaskara, Kottayam, helped me with the names and identification of plants and trees. The year following the completion of the text, 1979, was disastrous for Sanskritists and Oriental scholars generally. Four scholars of worldwide fame, including two members of our international committee and two contributors to the second volume of this book, passed away within the span of six months. Professor V. Raghavan, doyen of Indian Sanskritists, died on April 6, 1979. Professor C. Hooykaas, the leading authority on the religion of Bali, died on August 13, 1979. Professor J.A.B. van Buitenen, still engaged in his translation of the Mahabharata, died on September 21, 1979. Professor N. Tsuji, dean of Japanese Sanskritists and Vedic ritualists as well, died on September 24, 1979. We who remain pull closer together in a vain attempt to fill the gaps. While I was preparing the manuscript for the press, I was searching for a publisher. I had no success, even though I had started the search as early as 1975. One reason for this lack of results was that I felt that the book I had in mind should be illustrated with plates, using the beautiful photographs made by Adelaide deMenil in black and white as well as in color. This feeling reflected my growing conviction that ritual should not merely be read about, but should also be seen, and-if possible-heard. I was unwilling to compromise by proposing to sacrifice either comprehensiveness or quality, feeling that the excellent materials brought back from India deserved a definitive scholarly account, with adequate presentation of information, texts, pictures and-if possible-sound. There was another reason for my lack of success in finding a publisher. Until the National Endowment for the Humanities decided to support publication costs, it was relatively easy to obtain money for projects in the humanities, and almost impossible to find support for publishing them. The assumption was, apparently, that university publishers would take care of the manuscripts. However, this had long ceased to be the case. No one can keep up with the avalanche of manuscripts that the ideology of publish or perish has unleashed. Since producing the book I had in mind would be expensive, I had to find the money. I wrote more letters than I care to recall. In approaching publishers and foundations, I received help from Berkeley's Chancellor Bowker and from the Berkeley Foundation of the University of California. I also corresponded with UNESCO and with the Government of India. There are great similarities between these three bureaucracies, and we reached a point where I was uncertain whether their wheels were still moving, or had ground to a halt. In 1978, when despair was near, the Rock Foundation donated $90,000 to enable me to transform the almost completed manuscript into a spectacular book. There were no formalities, no application procedures, no reports, and in no time the arrangements were completed. There was only one restriction on the use of the grant, which I accepted enthusiastically: the funds should be used entirely for the material production of the book, and no part of it spent on overhead or other administrative costs. Unfortunately, these funds were spent differently and only partially recovered. This explains the four-year delay, as well as the high price and reduced quality of publication, cost having risen. Publication was finally achieved through the efforts of Edward M. Stadum, a lawyer and friend. I owe a great debt to Pamela MacFarland, Assistant Editor for Volume II, and Dr. Muneo Tokunaga, who checked the Sanskrit texts before they were printed by the Bhandarkar Oriental Research Institute, Poona, under the expert supervision of Professor R. N. Dandekar. I am especially grateful to Mrs. B. S. Staal who assisted with the preparation of the indexes. Insiders will note that these volumes are to some extent inspired by Gordon Wasson's book on Soma. This is as it should be, for Agni and Soma are the closest of ritual companions. Moreover, I value not only Wasson's book and his friendship, but admire the boldness of his hypothesis, and agree with him that Vedic culture is too important to be left to the Vedists. The cost of production of this book is due not only to its quality, but also to the illustrations. Here I depend entirely on others, though the selection is my own. My greatest gratitude goes to Adelaide deMenil, who made the photographs of the 1975 performance, and permitted me to select and use what I wanted. Two plates were provided by Dr. Asko Parpola from his photographs taken on the same occasion. 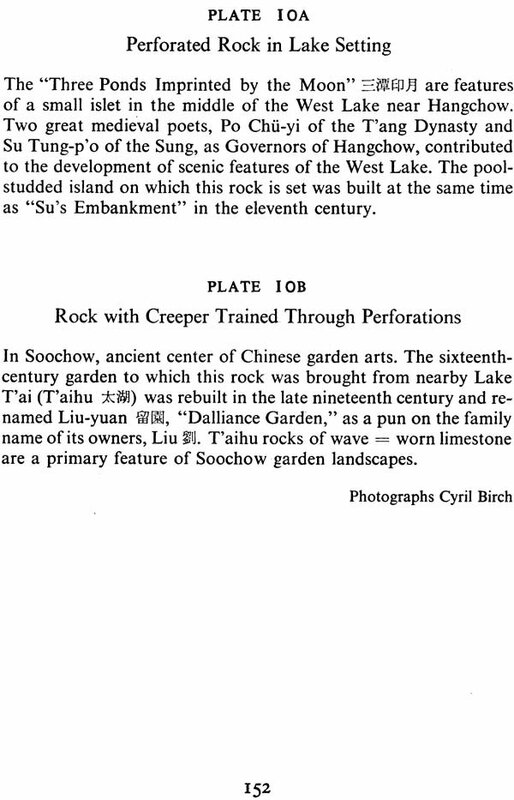 I am grateful to him, and also to Professor Cyril Birch and Kuo Li-ying for the opportunity to publish photographs they made in the People's Republic of China and in Japan, respectively, and to Professor George Dales, who drew Plates 22-32 and helped me with the description of ritual implcments. Grateful acknowledgement for the use of illustrations is furthermore made to Ajit Mookerjee, London and New Delhi; Professor G. R. Sharma, Allahabad; the Collection of the National Palace Museum, Taipei, Republic of China, where I was helped in particular by Miss Wang Ch'ing-hung, Mr. Liu Tang-ping, and Mr. Mark Landes; the E.M. Scratton Collection, Ashmolean Museum, Oxford; the Archaeological Survey of India; and the American Oriental Society. I thank Louis T. Judson for helping me produce the tape cassettes that accompany these volumes, another delicate and time-consuming task. The University of California, and in particular the two departments of Philosophy and of South and Southeast Asian Studies, have repeatedly allowed me to be absent, and at most other times made do with my physical presence when my mind was in the Agnicayana. The same holds for my students and my family, so much so that my son Nanoo, before he could properly talk, already referred to the ritual as "ugly China." I am truly grateful to my colleagues, students, and family for granting me such privileges, without which it would not have been possible to complete this book. Finally I should give vent to a question that I have sometimes asked myself. Why should I, a philosopher and Sanskritist, have spent years of my life with an obsolete ceremony? Am I weary of the present? Or am I merely tired of words and meanings, and have turned to sounds and activities? If I look at the issue negatively, this may be so, though my turning is still a turning of words. However, from a positive point of view, I have long stood in awe of this unique survival, so archaic yet so sophisticated, so close to the early history of man, and so lovingly preserved through millennia that elsewhere saw the birth and death of entire civilizations. 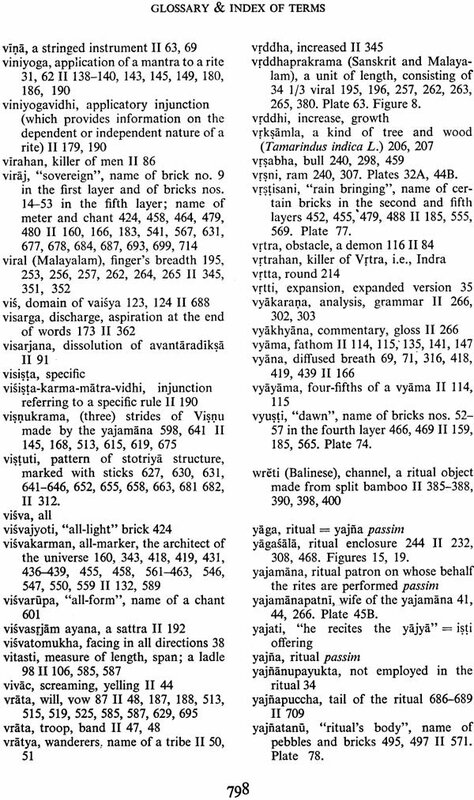 While pyramids, temples, cathedrals, and skyscrapers were built and fell into decay, languages and religions came and went, and innumerable wars were fought, the Vedas and their ritual continued to be transmitted by word of mouth, from teacher to pupil, and from father to son. What a triumph of the human spirit over the imitations of matter and the physical body! A continuity verging on immortality-though not of any individual person. And so I found myself evolved not merely in the past, but in the present and the future as well. A curious combination of circumstances and accidents put me in touch with venerable tradition, and then in almost complete possession and control physical manifestations on tape, plate, and film. The time had come for reading Nambudiri ritualists to be willing, indeed eager, to reveal and Date to me these cultural treasures, which had always been hidden from outsiders. Here was a unique opportunity, indeed a responsibility, to continue the oral tradition by means of a book. Here was something for which I was so well placed and equipped that I could almost believe that only I could do it. I was fortunate and responded to the challenge as a matter of course. MORE THAN THREE thousand years ago, nomads crossed the mountain ranges that separate Central Asia from Iran and the indian subcontinent. Leaving behind the dry steppes of their ancestral home, they entered the fertile plains of the upper Indus and came in contact with scattered remnants of an earlier civilization. These nomads imported the rudiments of their social and religious system along with their Indo-European language, which developed into Vedic, and later into Sanskrit. They worshipped fire, called agni, and adopted the cult of soma-a sacred plant, probably a hallucinogen-which grew in the high mountains. 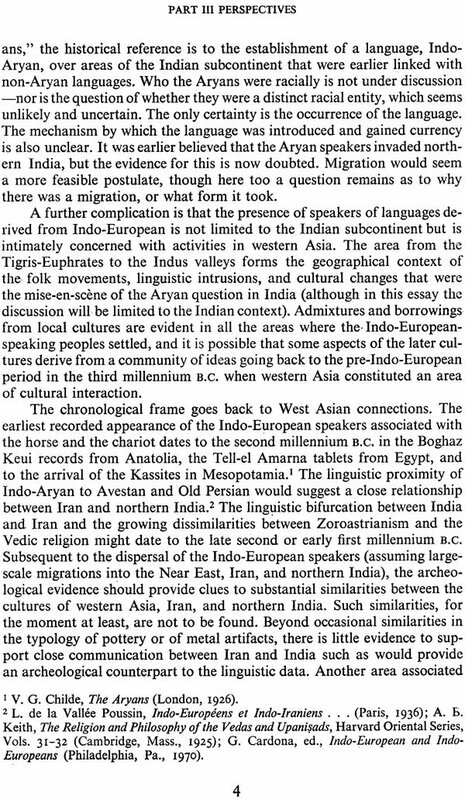 The interaction between these Central-Asian adventurers and earlier inhabitants of the Indian subcontinent gave birth to Vedic civilization, called after the four Vedas: Rgveda, Samaveda, Yajurveda, and Atharvaveda. 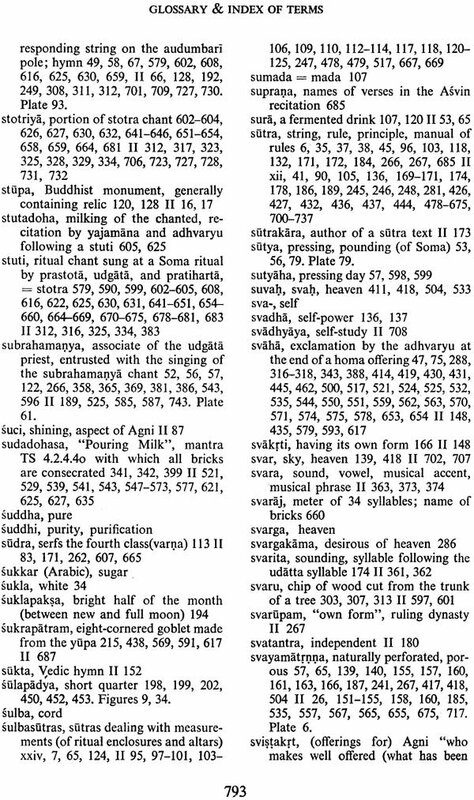 These Vedas, oral compositions by bards and priests, have been transmitted by word of mouth to the present day. Their guardians, the Brahmins of India, are each attached to one of the Vedas by birth. 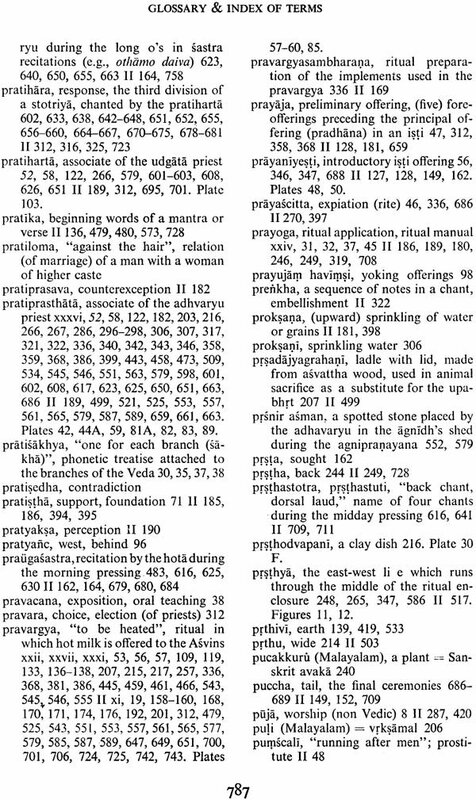 The Vedas depict Vedic religion, in the words of Louis Renou (1953, 29) as "first and foremost a liturgy, and only secondarily a mythological or speculative system." The larger Vedic rituals were primarily dedicated to Agni and Soma. Ai was not only a god in his own right, but the divine messenger and intermediary. The offerings, primarily of clarified butter (ghee), were poured into sacrificial fires installed on altars and Ai transmitted them to the gods. Special libations were made of juice extracted from the stalks of the Soma plants of the offerings were consumed by the celebrants. The ceremonies were accompanied by recitations from the Rgveda and chants from the Samaveda. According to the Rgveda itself (7.26.1), pressed juices unacaDc3az) b sacred hymns have no effect. The celebrations required the execution of multifarious activities, distributed among priests from different Vedas, who officiated on behalf of, and for the benefit of, a ritual patron, the yajwnana. 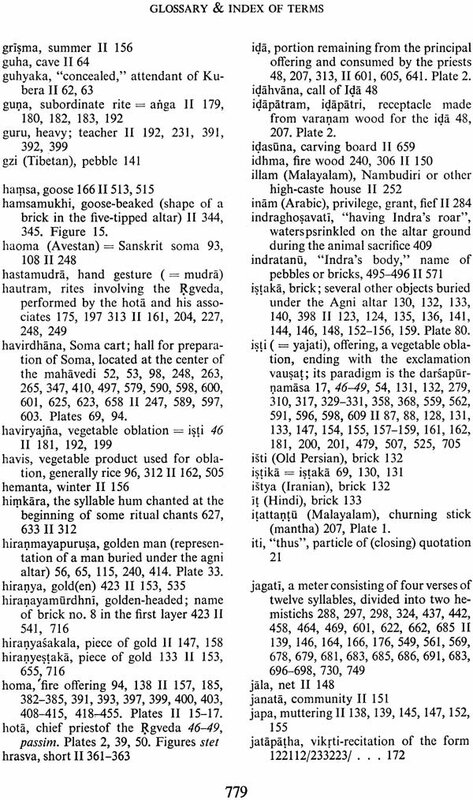 One of the most elaborate of these ceremonies was called Agnicayana, the "piling of Agni," or, simply, Agni. This ritual originated around 1,000 b.c. 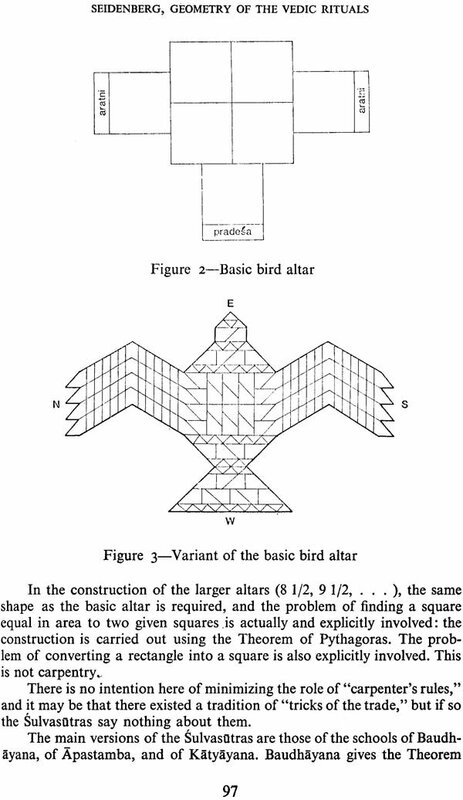 During its performance, a large altar in the shape of a bird, dedicated to Agni and itself also called Agni, was piled from more than a thousand bricks. 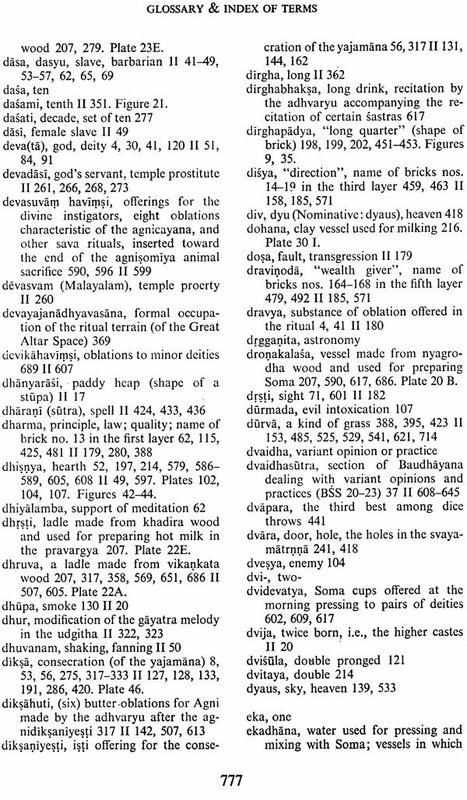 The Agnicayana plays an important part in the Vedic literature after the Rgveda, and especially in the Yajurveda. 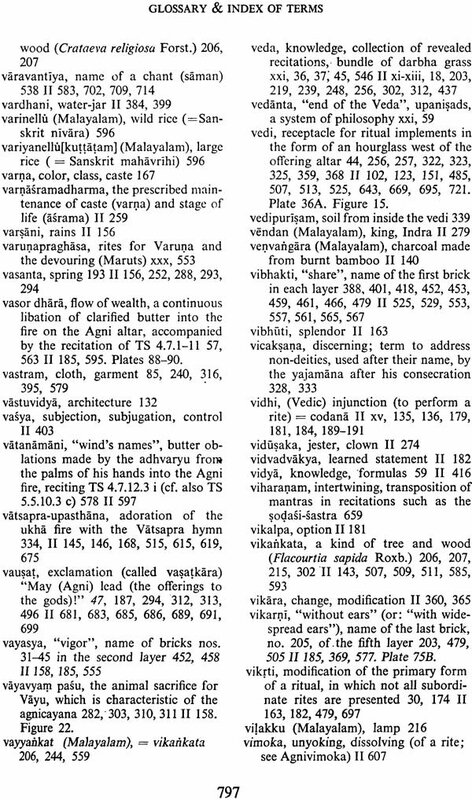 Unlike the 1gveda, which remains curiously alien to India (see Renou 1960), the Yajurveda occupies the center of Vedic culture. It constitutes the foundation of the ritual and of the edifice of the Vedic schools. 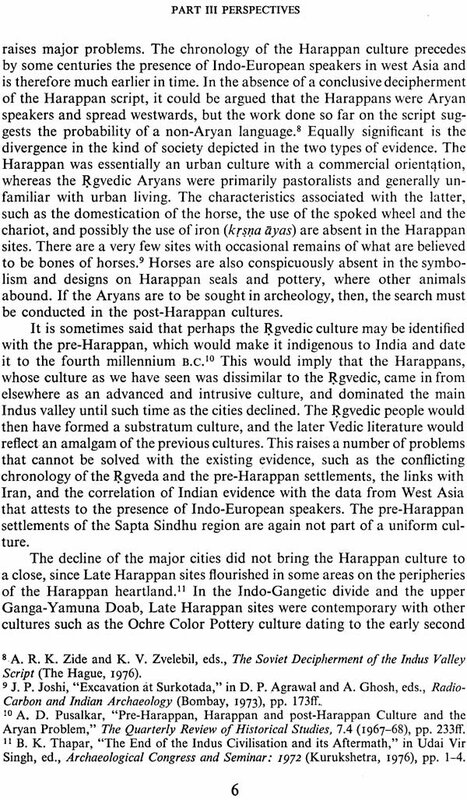 More distant from the Indo-European background than the Rgveda, the Yajurveda exhibits a more Indian flavor, is closer to the beginnings of Hinduism and Buddhism, and preserves features of earlier Indian cultures. In all these respects, the Agnicayana ritual occupies a similar position. 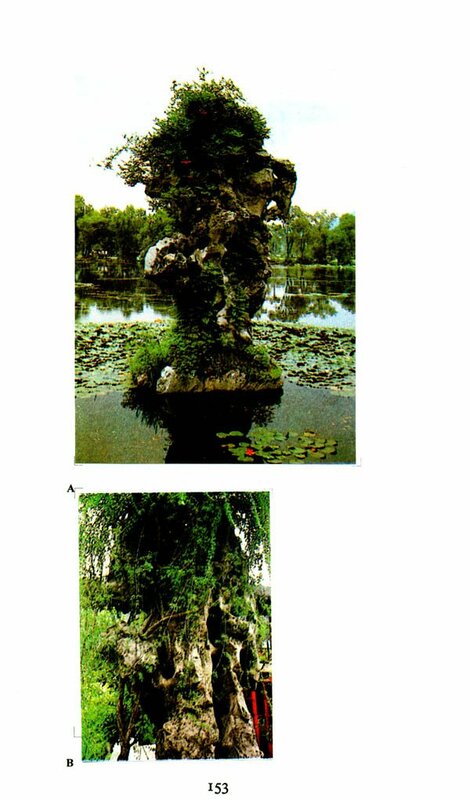 Though it incorporates the Indo-European fire cult and the Indo-Iranian cult of Soma, these begin to be overgrown by numerous features not found outside India. These features are not Indo-European or Indo-Iranian, but are recognizably Indian. The Agnicayana shows us India beginning to assert herself. Though Vedic ritual was confined to an elite, its performances must have been relatively common for about five centuries. This period-which lasted for a shorter time than Manichaeism or Islam, but longer than Protestantism -may be called the age of Karman ("ritual activity"). Around 550 B.C. 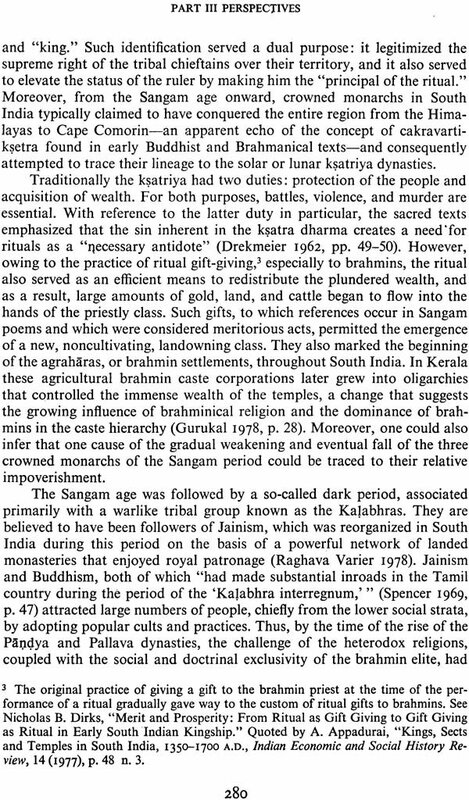 Vedic culture began to decline. Further east and south, new religions and cultures rose to prominence. Though Hinduism and Buddhism are replete with Vedic elements, they belong to another age, the age of jnana ("knowledge"). Hinduism continued to look upon the Vedas as its source, formally transmitted by the brahmins, regarded as eternal revelation, "of nonhuman origin" (apaurseya) and no longer understood. Buddhism rejected the Vedic heritage, the authority of Brahmins, and the supremacy of ritual. In due course it evolved its own hierarchies and ceremonies. Fragments of the original Vedic ritual survive to the present day in the domestic rites of the brahmins, such as marriage ceremonies. Despite attempts to revive them, we hear less and less of the larger Vedic ritual celebrations. 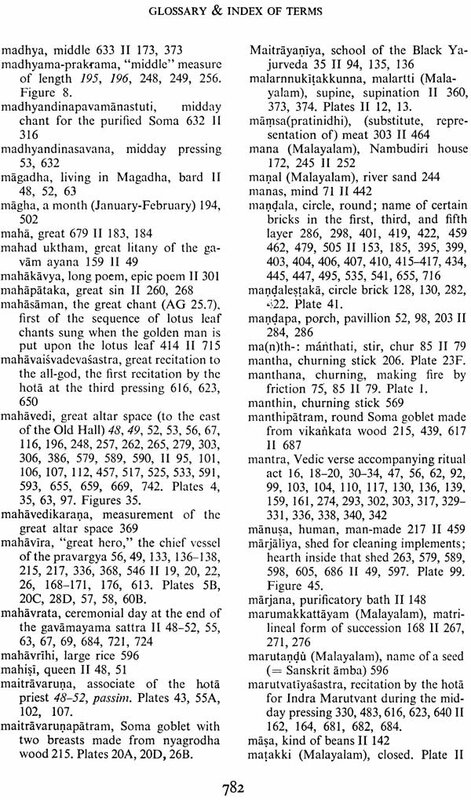 In the eleventh century A.D, the logician Udayana could declare that the great Vedic ceremonies were no longer performed (Renou 1960, 21, note 4). India, however, is a land of miracles, in a distant cornet of southwest India, Kerala, far away from the original home of Vedic civilization, a few families among the isolated and orthodox community of Nambudiri brahmins have maintained their Vedic tradition and continue to perform two Vedic rituals: the Agnihotra, which lasts five days, and the Agnicayana or Agni, which lasts twelve days and continues through some of the nights, from which the name Atiratra ("overnight") derives. We know little of the history of these performances; their continuation was unknown to the outside world. The Nambudiri performances are not artificial or scholarly reconstructions (as have taken place in some other parts of India), nor are they the results of recent revivals. The tradition is authentic and alive. Though this will be apparent from the present work, it can be directly observed in the attitude of the performers. When the Nambudiri ritualists are told that, according to the classical texts, certain rites used to be performed differently in the past, they say, "Interesting." Not for a moment would they consider changing their own ritual practice in the light of such information. They perform the rituals as they have learned them from their preceptors. It is their tradition. During the last hundred years, the Agnicayana has been performed seventeen times; during the last fifty years, five times. After a gap of almost twenty years, it was celebrated again in 1975. For the first time in history, it was attended by outsiders. On this occasion, the performance was not only witnessed but filmed, photographed, recorded, and extensively documented. The only restriction was that non-Nambudiris could not enter the ritual enclosure, in which most of the ceremonies took place. 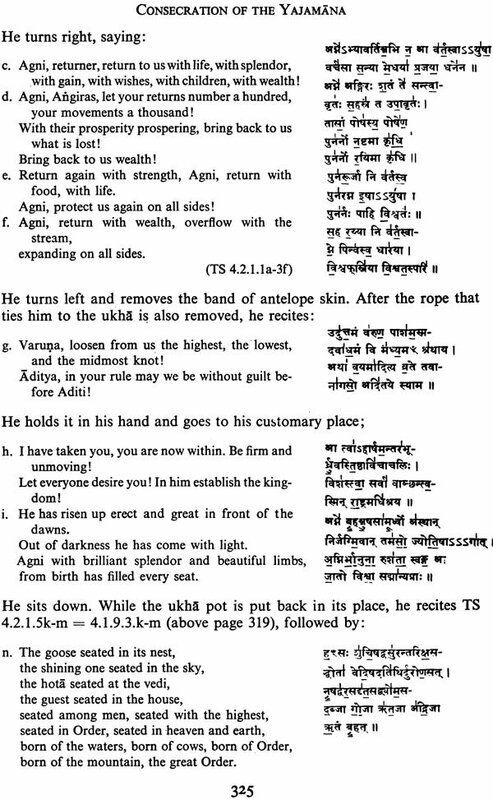 This 1975 performance of the Agnicayana, which was possibly the last, is the subject matter of the present publication. We must be content with very general theories if we are to avoid arbitrary explanations such as those put forward in the old Brahmanas, where we find fabricated accounts of the origin of various details in the liturgical ceremonial. In these stories there is much that deserves attention, but the indanaor bandhu, the hidden connection that they try to establish, cannot be accepted; it is too visibly the product of the priestly mind. It is recognized in the texts that comprehension must cease at a certain point: they declare "paro'ksakama hi devab," "the gods love what is out of sight" (1953, 16; with a modification in the translation). The recitations that accompany the rites often express specific desires: for health, strength, sons, victory, heaven, and immortality. The list of wishes and desires is not so different from that of modern man. It is not exclusively spiritual, as some contemporary visionaries have claimed, nor is it wholly materialistic, as some critics have asserted. As can be seen at a glance from the recitations recorded in this book, the same desires are repeated over and over again. Does this mean that they were never fulfilled? In spite of a certain poetic variation, such repetitiveness would almost seem offensive, not least to the gods. However, it is universally believed, and by the best of minds, that repetition increases effectiveness. Today, similar repetitions are thrust upon us by politicians and the media-not to mention commercials. Bertrand Russell was criticized for his antiwar speeches by a general: "Do you not think there is some lack of a sense of humour in going on reiterating the same thing?" Russell observed that, if it would not serve any purpose to repeat himself, "I failed to see why he was so anxious to prevent-me from doing so." By the time the Vedic rituals had reached their greatest elaboration, these reiterated wishes receded into the background. 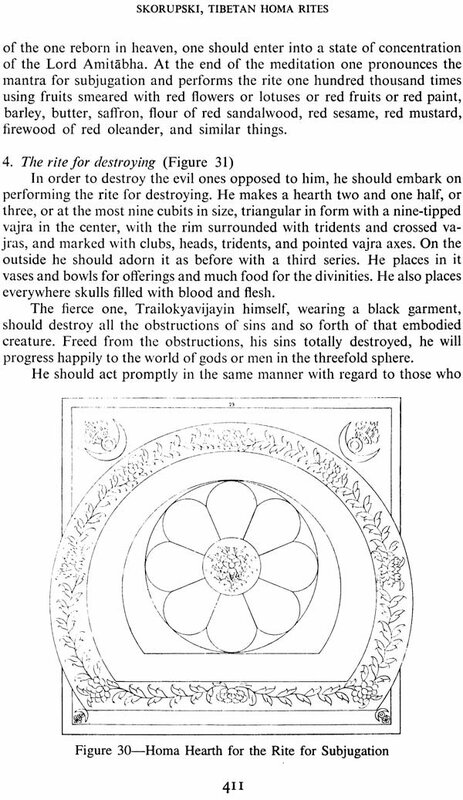 Their place was taken by a codification of the two kinds of rites we have already met: the grhya or domestic rites-which are "rites de passage," life-cycle rites or sacraments, accompanying such events as birth, initiation, marriage, and death-and the srauta rites, which the French call "rites solennels." There are several general and formal differences between these two kinds of ritual. 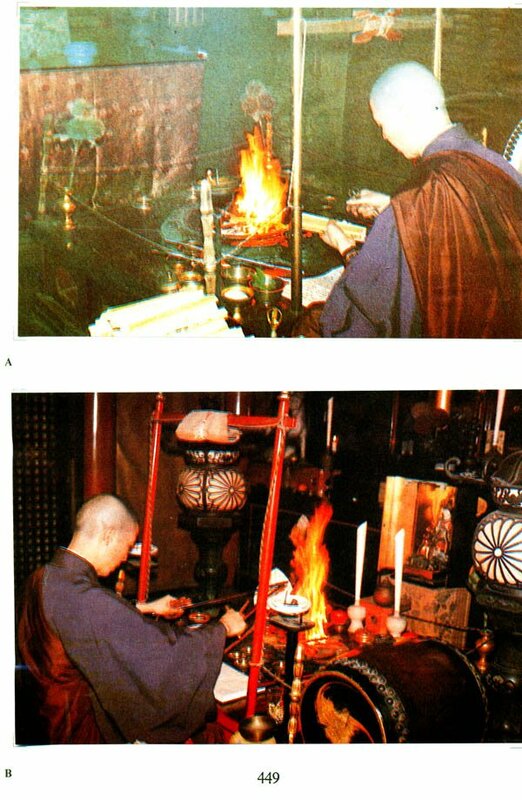 For example, the srauta rites require three fire altars and the services of several priests, whereas the domestic rites require only one fire (the domestic fire) and one priest (the domestic priest). While the function of the domestic rites appears to be fairly straightforward, the significance of the srauta rites is not obvious. The srauta ritual, with its myriad ramifications, exhibits the unhampered development of ritual construction and creativity. It is therefore more important for the understanding of ritual than the domestic rites. There are, moreover, srauta rituals that last a thousand years, which shows that some of the rites were purely theoretical. 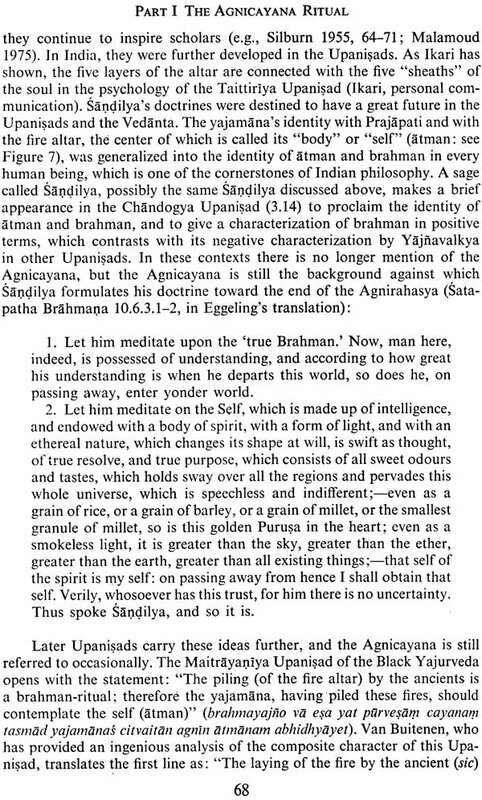 Such theoretical constructs (which the grammarian Patanjali compared to the infinite uses of language) should not be brushed aside, as was done by Hillebrandt, who referred in this connection to "myth and fantasy" of the ritualists (1897, 158). On the contrary, they are as important for the theory of ritual as are concrete ceremonies. Many rites have, in fact, an intermediate status. 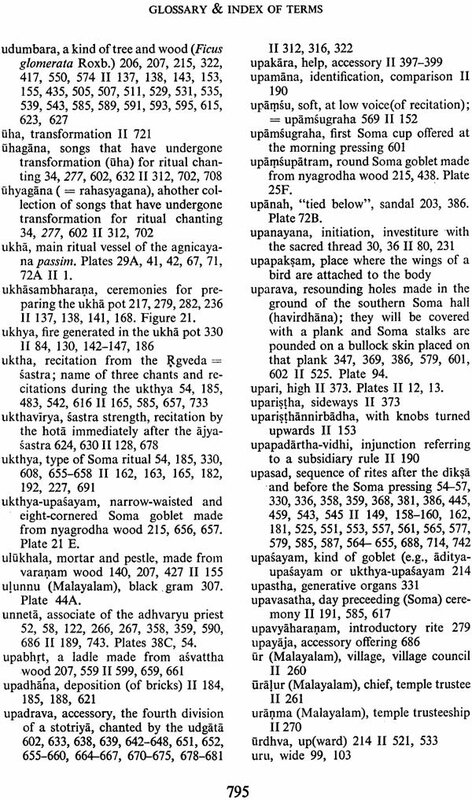 The Agnicayana, which was performed in 1975, is a srauta ritual that seems to have been always "real," though some of its extensions, which the texts describe, smack of theory. This is for Agni, not for me (agnaye idam na mama). He who desires heaven shall sacrifice with the Agnistoma ritual (agnistomena svargakamo yajeta). But this fruit is renounced whenever the yajamana utters his tyaga formula of renunciation. The effect, therefore, is not obtained. The resulting picture is further complicated by another apparent contradiction. 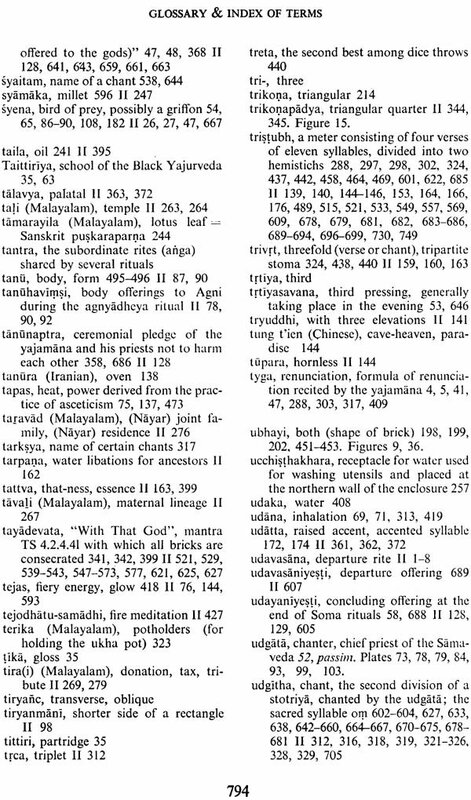 The rites are subdivided into two classes, "obligatory" (nitya) and "optional" (kamya). Unlike the Agnicayana, which is kamya, the Agnistoma is a nitya rite: every brahman has the duty to perform it. So here is a ritual that appears to be optional, since it is confined to those who desire heaven (nobody's duty), but that is also not optional because it is a prescribed duty, and that does not bear any fruit because its fruits are ultimately abandoned. The texts reflect such contradictions. 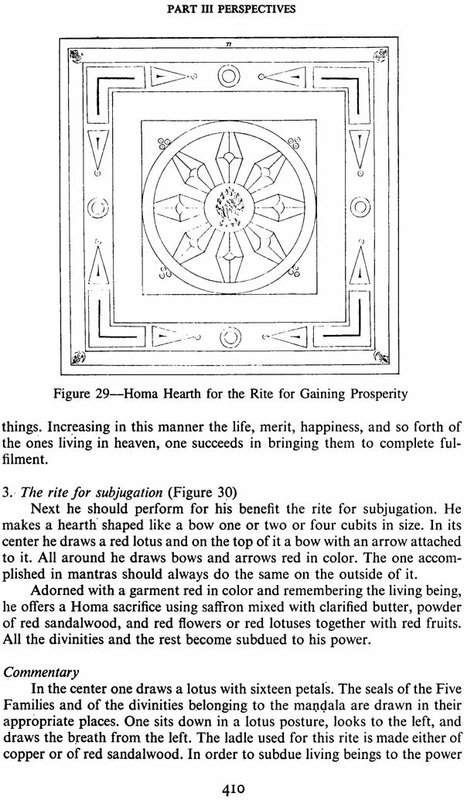 The Mimamsa Sutra, basic manual of the ritual philosophy of the Mimamsa, lays down that the rites lead to happiness, but the subcommentary "Straight Spotless" (1juvima1a) observes that this does not apply to obligatory acts. The Mimamsa philosophers faced another difficulty. When a ritual performance is completed, no fruit is seen. The yajamana, on whose behalf the rites have been performed, does not rise up and go to heaven. Rather the opposite: he returns home and is, as the texts put it, the same as he was before. In particular, he must continue to perform the morning and evening fire rites (Agnihotra) for the rest of his life. The Mimamsa concluded, quite logically, that the fruit of ritual activity is-temporarily-unseen. It will become apparent only later, e.g., after death. An elaborate theory was devised to show that this is in accordance with the mechanism of karman, according to which every cause has an effect. 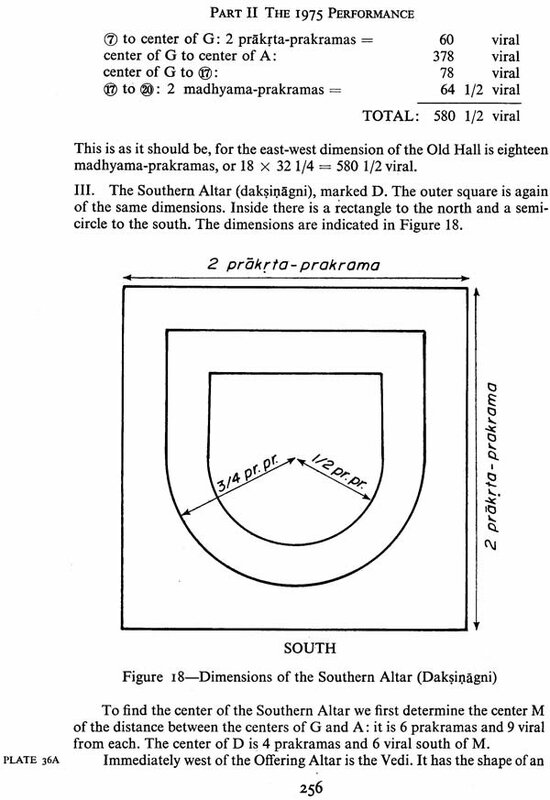 A special logical theorem, called arthapatti, was invented in support of this theory. The followers of the Mimamsa were criticized by others (e.g., the philosophers of the Advaita Vedanta) for postulating such unseen effects. For whatever our contemporary fads may suggest, in India the unseen is resorted to only under duress. What the Mimamsa in fact ended up teaching is that the rituals have to be performed for their own sake. The notion of tyaga, "renunciation," has attained an important position in Hinduism through the teachings of the Heaved Gita. Here Sri Krsna advocates, as the highest goal of life, a mode of activity in which acts are performed as usual, but the fruit (phala) of action (karman) is always renounced (karma-phala-tyaga). 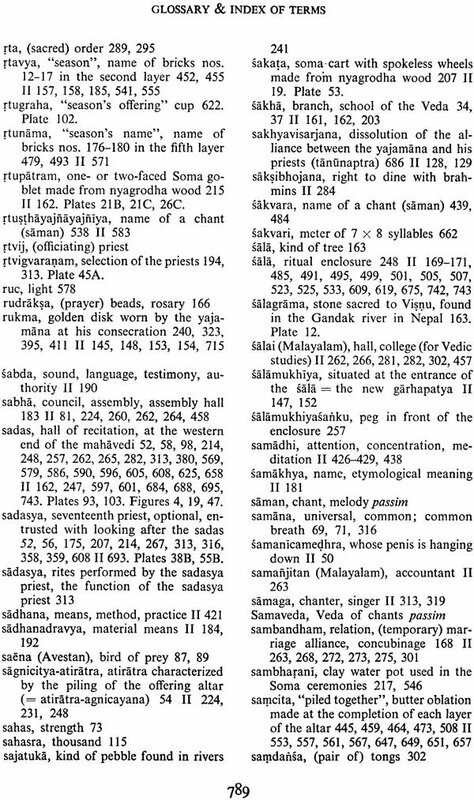 Unlike the Brahmana literature and the Mimamsa, the srauta Sutras are not concerned with interpretation. They confine themselves to description and address insiders. They were in no sense teaching manuals. Their description is not enumerative, but highly structured, and uses abstract principles of organization. The Srauta Sutras exhibit the science of ritual as an intellectual discipline. In doing so they influenced and determined the development of scholarly and scientific methodologies in India. 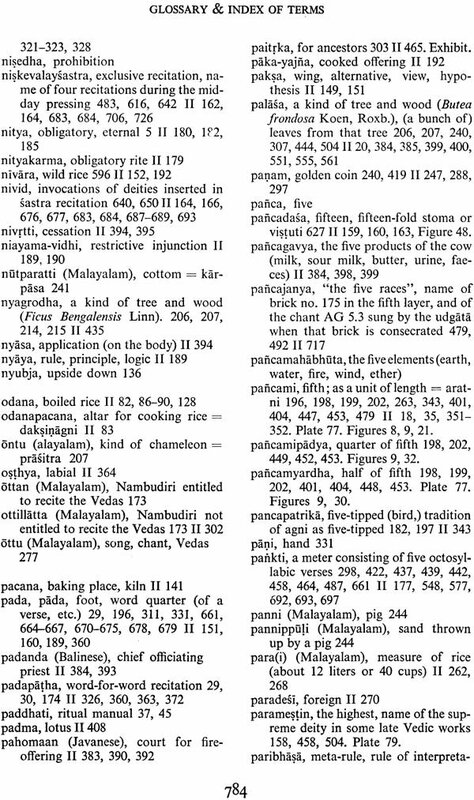 The ritual rules (sutra) are formulated carefully and consistently, the use of metarules (paribhasa) enables the authors to explicate structure and avoid redundancy, and the logical organization of the system of rules is brought out explicitly. 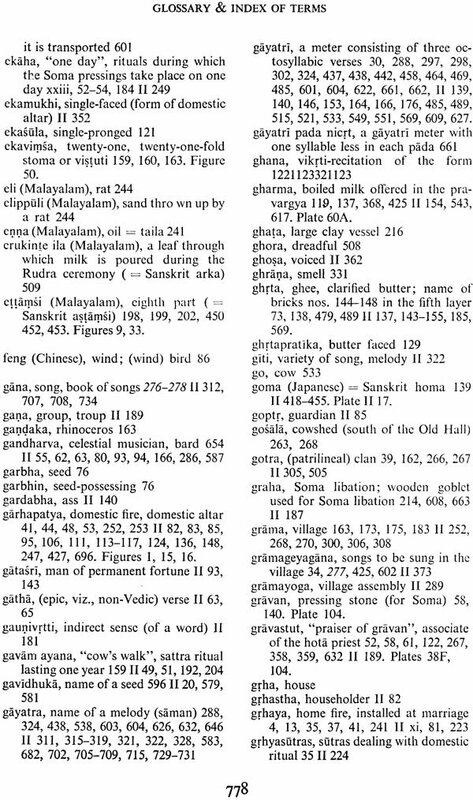 All these features developed gradually and paved the way for the work of the Sanskrit grammarians. Directly or indirectly, they contributed to many of the more technical features of Indian logic and philosophy, which are often expressed in sutra form. It is not the complexity of the ritual itself, but the Srauta Sutras' explicit, systematic, and exhaustive characterization of that complexity that is the first manifestation of the Indian scientific and scholarly genius. It is difficult to exaggerate the importance of ritual for the civilizations and religions of India, for it is their basic feature. Accordingly, for a Hindu or Jaina, and to some extent for a Buddhist, what he does is more important than what he thinks, believes, or says. Earlier, I referred to the orthodoxy of the Nambudiri brahmins. It would have been more appropriate to use the term orthopraxy (from Greek, "right," "opinion," and "action"). Ritual activity is physical activity and is therefore primarily related to the body, unlike thinking or believing, which are mainly connected with the mind. Ritual affiliation is therefore determined by birth, and not by choice or preference. Unlike religious sects, ritual traditions coexist more or less peacefully, they are mutually exclusive, and there is neither desire nor mechanism for conversion. This feature, too, has become a mark of Indian religions. The study of the Vedic ritual ceremonies was taken up by European Sanskrit scholars in the nineteenth century. 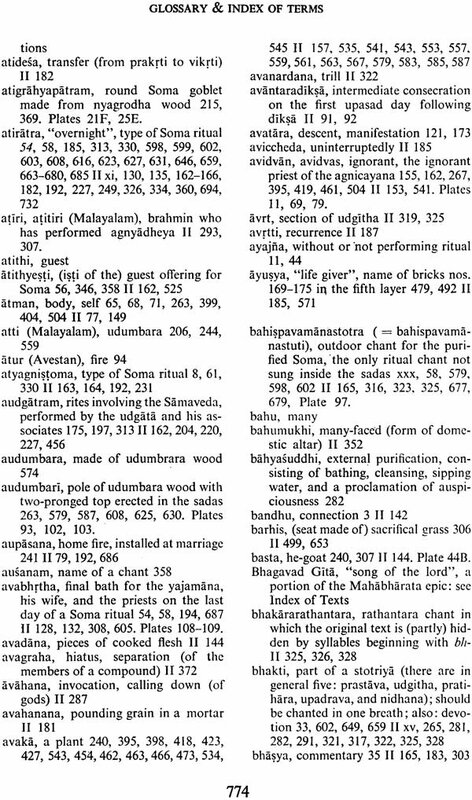 In 1805, Colebrooke mentioned several srauta ceremonies, quoting from the Satapatha Brahmana. 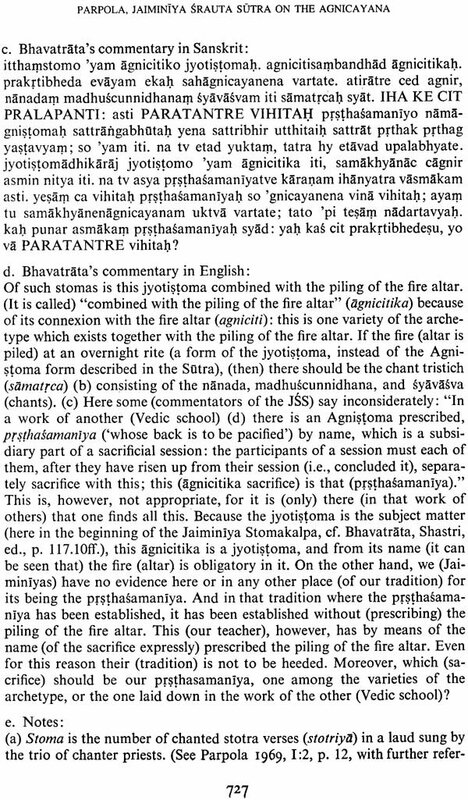 He did not mention the Agnicayana by name, but referred to it when mentioning that four books of the text "teach the consecration of sacrificial fire: and the tenth, entitled Agnirahasya" (see below page 63) "shows the benefits of these ceremonies" (Colebrooke 1873, 54). The first survey that resulted from these European studies appeared at the end of the century in Hillebrandt's Ritual Literatur Vedische Opfer unit Zauber of 1897. Around the turn of the century, Willem Caland (1859-1932) opened up the study of Vedic ritual in its full depth and complexity. By publishing and translating some of the Srauta Sutras (upon which the excerpts from Baudhayana in our second volume are based) he showed that there was a science of ritual and explicated for the first time in a Western language the Indian systems of ritual rules. Apart from ritual, he wrote extensively on the arcane subtleties of the Samaveda and explained its liturgical raison detre. He left a few questions unanswered. In due course, I obtained their answers from Itti Ravi. The paradigm of the Soma rituals was described by Caland and Henry in the two volumes of their Agnistoma of 1906. As we have seen, this is the five-day ritual that the Nambudiris have preserved. Since the publication of the monumental "Caland and Henry," Western, Indian, and Japanese scholars have explored the ritual texts, and especially the Srauta Sutras, in breadth and depth. 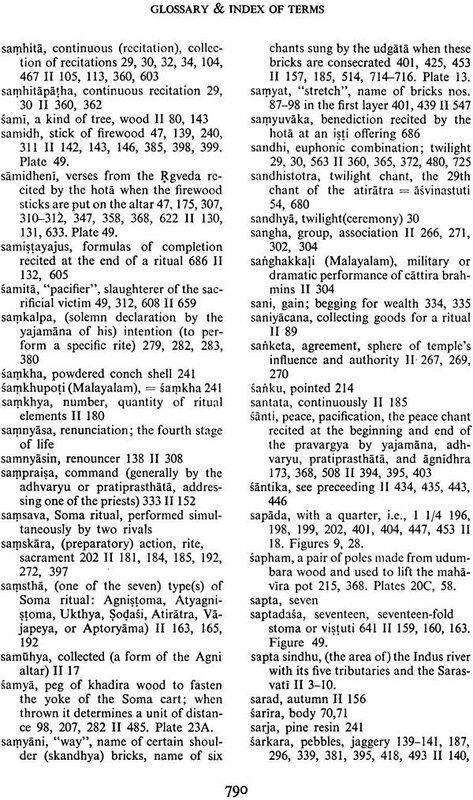 Hillebrandt dealt with the Darsapurnamasa (Full- and New-Moon ceremonies), Schwab with the Pasubandha (Animal Sacrifice), Dumont with the Asvamedha (Horse Sacrifice) and the Agnihotra (Daily Fire Worship), and Tsuji with the Srauta Sutras of the Rgveda and Yajurveda. Renou published a monograph on the ritual schools. 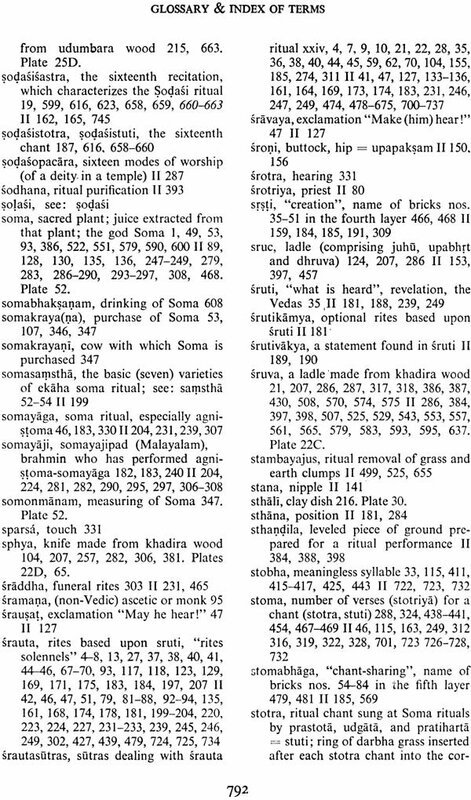 The Vaidika Samsodhana Mandala of Poona contributed a series of studies, culminating in a collective work, directed by Dandekar and Kashikar, entitled Srautakoa, an encyclopaedia in several volumes on the srauta ritual. 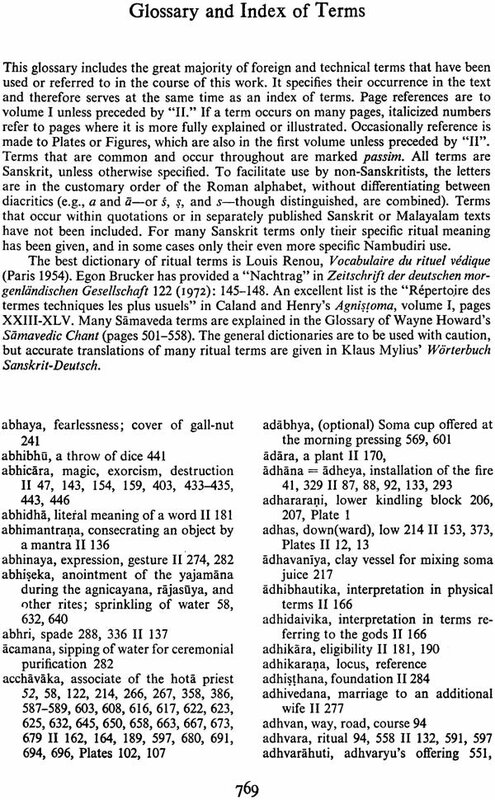 Renou provided a small dictionary of technical terms used in the ritual, as well as several specialized studies. 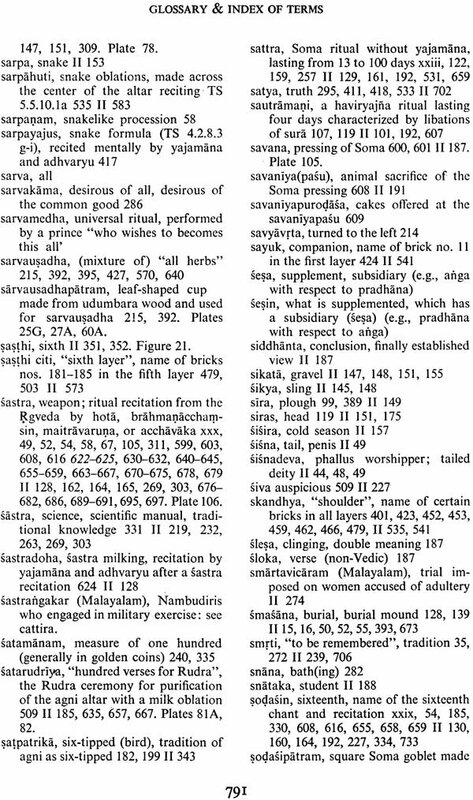 More recently, the Srauta Sutras of the Samaveda were studied by Parpola; the A.va1ayana Srauta Sutra of the Rgveda by Mylius; the Baudhayana, Bharadvaja, and Varaha Srauta Sutras of the Krsna Yajurveda by Kashikar; and particular rites by a host of others, for example, the Rajasuya or Royal Consecration by Heesterman, the Pravargya by Van Buitenen, the Sarvamedha and the Samsava by Mylius, and the Mahavrata by Rolland. More general and interpretative studies have been written by Levi, Rau, Gonda, Heesterman, Thite, Biardeau, Malamoud, and many others. 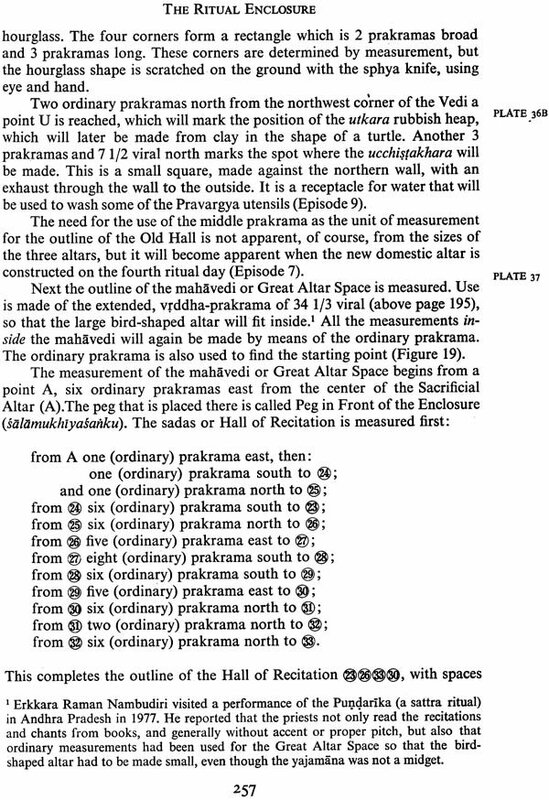 Some of the Sulba Sutras, dealing with the measurement and construction of Vedic altars by means of a cord or rope (sulba)-formerly explored by Thibaut, the historian of mathematics Cantor, Van Gelder, and Raghu Vira-have been studied recently by Satya Prakash, Swarup Sharma, and Seidenberg, and have been published by the Research' Institute of Ancient Scientific Texts of New Delhi. Numerous links of the srauta ritual with history, archeology, art, architecture, music, religion, anthropology, economics, linguistics, literature, mathematics, science, mythology, magic, and philosophy are only beginning to be explored. Gonda's study on the origins of the Indian drama in the Vedic ritual and Kashikar's study on Vedic pottery are examples of what can be done. A new area of research involving botany and pharmacology is opened up by the works of Wasson and Flattery on the hallucinogenic origins of the Soma. Insofar as information on the ritual is concerned, all such studies are confined to texts. Yet, as Renou observed, "one cannot grasp even the outward meaning from reading the text by itself unless one is gifted with the rare virtuosity of a Caland" (1953, 34). 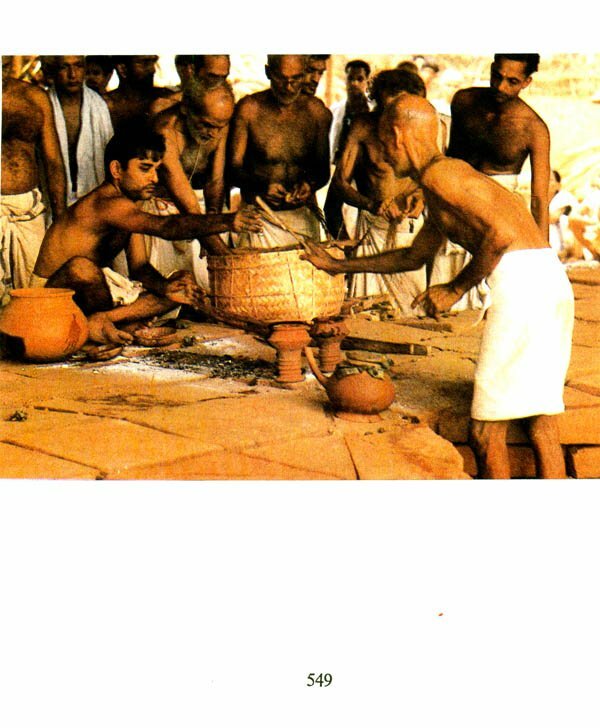 Direct information on living ritual in contemporary India is mostly confined to temple ritual, the domestic ritual of the higher castes, other caste rites, village rites, and tribal rituals. Traces of the Rajasuya are preserved in Southeast Asia and in Nepal, and in India in temple worship and puja, which retain elements of the consecration rite (diksa). Until recently it was quite unknown that the srauta rituals, which are much more spectacular than any of these other rites, continue to be performed in India, albeit rarely and in a few inaccessible places. The fact that these almost three-thousand-year-old rituals are still alive would have astonished Hillebrandt or Caland. Once these survivals were discovered, it became obvious that many of the basic issues concerning the interpretation of the ritual, as well as numerous problems of a more technical nature, could only be brought closer to a solution if the living traditions were studied. At the same time it became clear that this study is a matter of urgency, since many of the few surviving authentic traditions are on the verge of extinction. 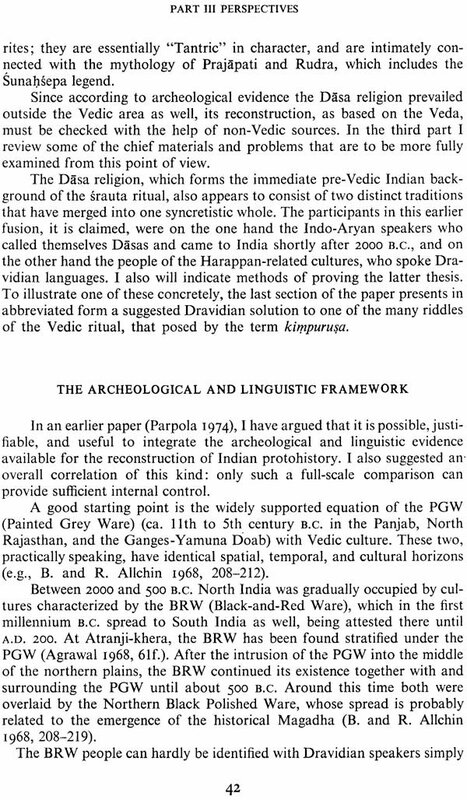 What ensued was a new era of Vedic research, which involves close collaboration with the traditional Indian ritualists, and which might be more properly called Vedic fieldwork (an expression first used by Kashikar in his Presidential Address to the Vedic section of the 24th All-India Oriental Conference, Varanasi 1968). An unexpected feature of this work is that the informed interest of scholars from all over the world gives fresh hope and inspiration to the rare Vaidikas who try to keep the srauta traditions alive. 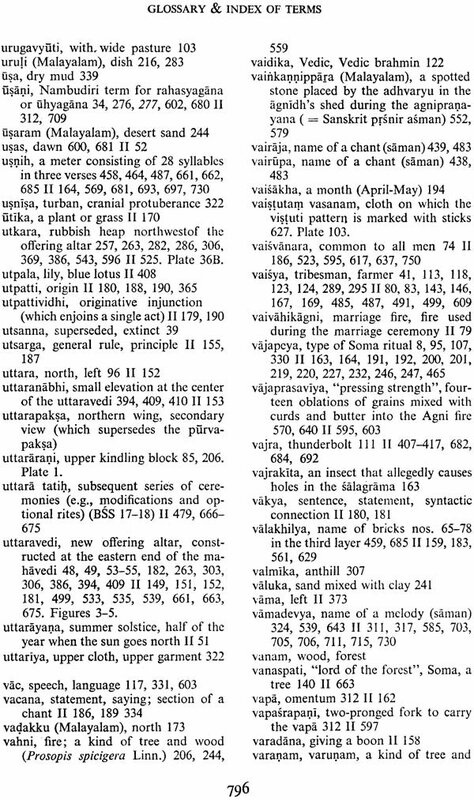 A chapter in our second volume (Part III, pages 193-25 1) will show how extensive these Vedic survivals are. Scholars who came in contact with the living tradition directed their attention first to the recitations of the Veda, which are not only prominent features of the ritual, but which are more easily accessible because they can be heard outside the ritual context. 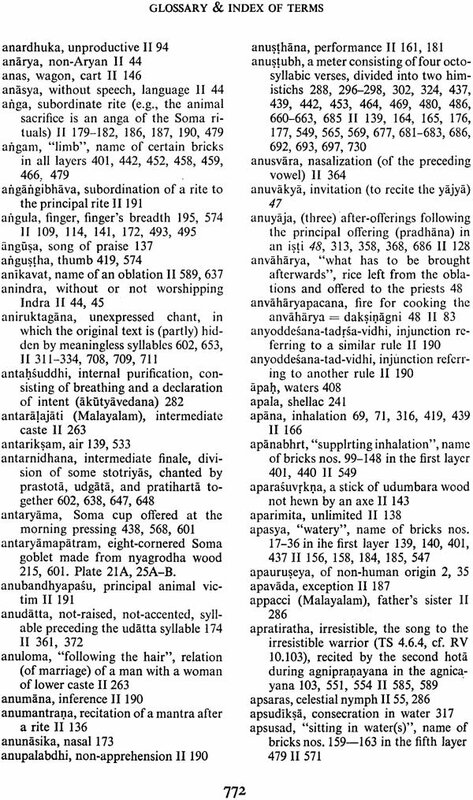 Nonbrahmins are not allowed to hear Vedic recitation or to attend Vedic rituals. This continues to make Vedic fieldwork a delicate affair. Not surprisingly, the first barrier was overcome first. Recordings were made and studied by Bake, Gray, Howard, Parpola, Raghavan, Sreekrishna Sarma, Van Buitenen, and myself. The Government of India, through its Sanskrit Commission, urged that complete recordings of the Vedas be made. All-India Radio also took an active interest. Subsequently, films of srauta ceremonies were made by Van Buitenen (of the Vajapeya) and by me (of fragments of an Atyagnistoma). When the ritual began to be studied also in its social context, it became apparent that much work was left undone by anthropologists. 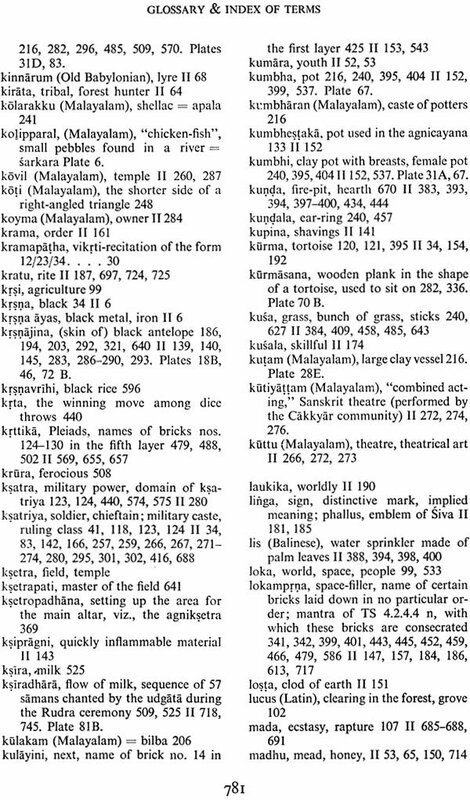 Except for recent work by Mencher, basic information on the Nambudiris, one of the main communities that maintains its Vedic culture, remains available mainly in the older manuals of ethnographers (e.g., Anantha Krishna Iyer), historians (e.g., Padmanabha Menon), and British District Collectors (e.g., Logan and Innes). If nothing else, the present publication will show that a great deal of Vedic fieldwork remains to be done and should be done before it is too late. At this point in history, each time one of the older Vedic ritualists dies, a portion of the 3, ooo-year-old tradition is irretrievably lost. 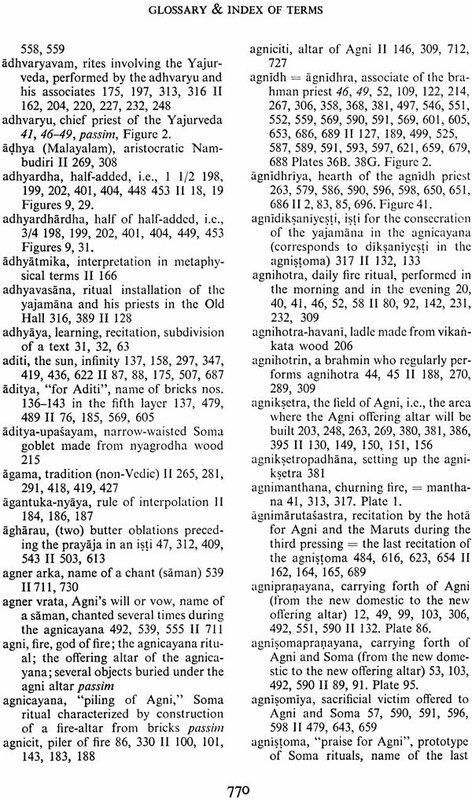 THE 1975 PERFORMANCE of the Atiratra-Agnicayana called attention to a ritual created in India almost three thousand years ago. 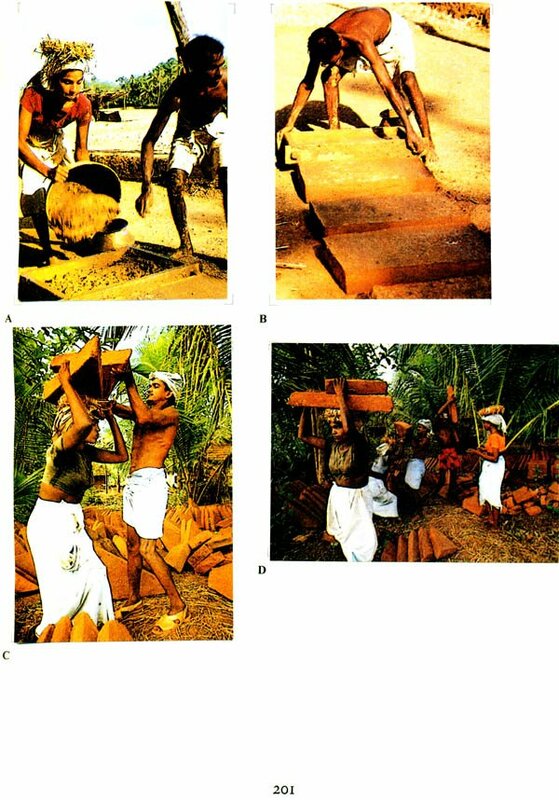 The first volumes of Agni sought to document and help preserve this ancient tradition. 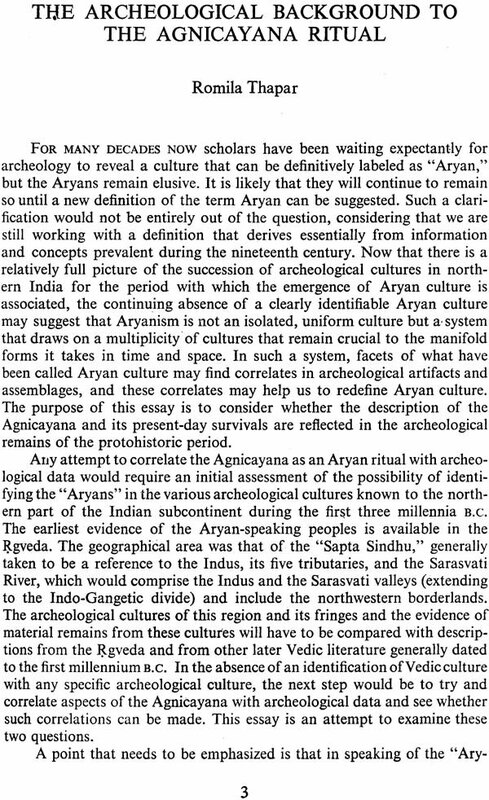 The ceremonies were described and depicted in explicit detail because of their intrinsic cultural value, because they provide the source material for many developments in Indian religion, and also because they can be used to con5rm, revise, or reject general theories of ritual and religion. This second volume of Agni probes more deeply into the authenticity of the Nambudiri Vedic tradition and seeks at the same time to explain how such a survival could occur. It shows that much is in fact known about the background, context, and history of the tradition, though some of this information is circumstantial and much of it is difficult of access. As a result of these investigations, the history of the religions of India now appears in new light: though Vedic beliefs and doctrines have disappeared or been transformed, Vedic practice has in fact continued. This is significant especial in India, where practice-Karman has always been more important than theory. The truth has escaped Indologists who confine themselves to texts rd doctrines, and anthropologists who merely scratch the surface. It has been further obscured by the popularization of artificial distinctions like that between so-called Great and Little Traditions. The second volume begins with Part III, "Perspectives," a series of contributions by scholars who elucidate the ritual, its background, and its many dimensions. Part IV, "Texts and Translations," provides sections from ritual manuals of the three Vedic schools represented in the 1975 performance. Part V is concerned with the audiovisual documentation of the Agni ceremony. Part III opens with historical studies by Thapar, Parpola, Heesterman, and Seidenberg. 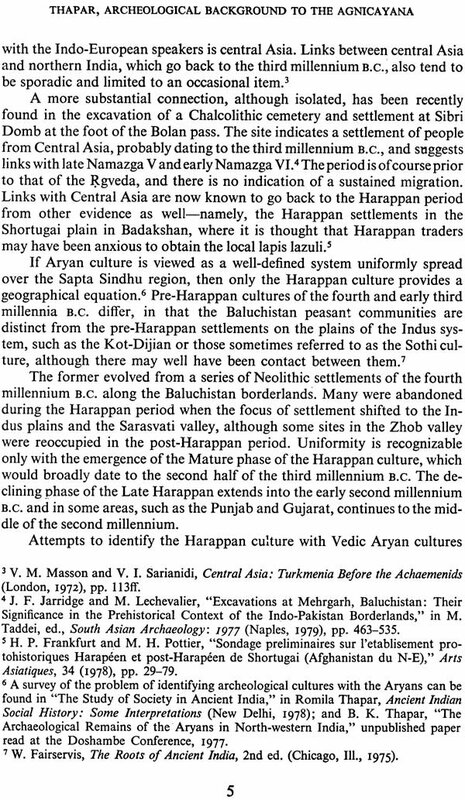 The perspectives adopted in these speculations are diverse; together they remind us of important gaps in our knowledge of early Indian nation', and they show us that our widely held assumptions about an Aryan invasion are not only simplistic but also questionable. Staal then analyzes e syntax of the ritual. 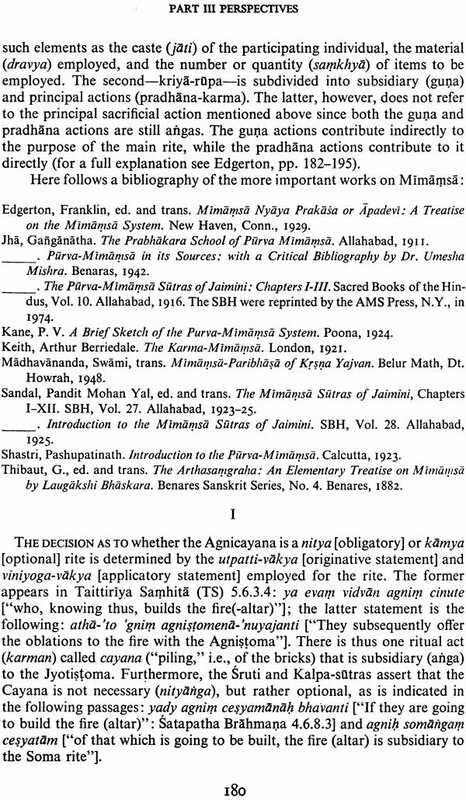 There follow philological articles primarily concerned with Sanskrit texts: Tsuji examines a Yajurvedic tradition that differs from that followed in 1975; Sreekrishna Sarma studies the Rgvedic sources underlying the 1975 performance; and Ikari explores a historical link between the Agnicayana and the Pravargya ceremony. Balasubrahmanya Sastri Eate5 how the Agnicayana has been treated in a later philosophic development. Although the continued existence of grhya rites among the twice-born castes is well known, the survey by Kashikar and Parpola shows how Vedic srauta traditions, too, are alive in many regions of the Indian subcontinent. 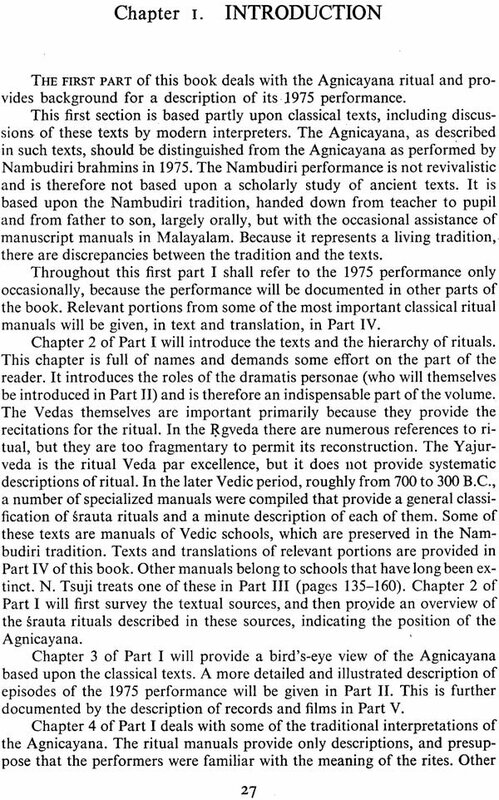 The subsequent eight papers focus on the Nambudiri tradition and elucidate features of Nambudiri Vedic culture. The picture that emerges modifies the common view that Vedic civilization disappeared and was in due course replaced by Hinduism. What we witness is in fact the continued existence of Vedic traditions, though often in remote areas. At the same time, many Indian traditions entered a new phase, which it is customary to call Tantric. This development can be traced in Kerala and among the Nambudiris, but its chief impact has been elsewhere. 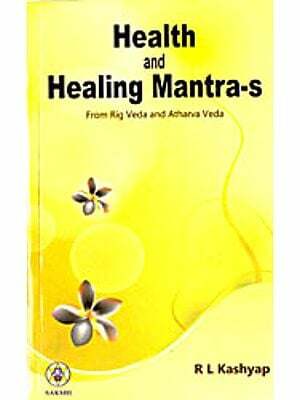 It is not within the scope of this book to treat the Tantric fire rites that have proliferated all over India during the last two thousand years. However, contributions by Hooykaas, Skorupski, and Strickmann show the extent to which such ceremonies spread over large parts of Asia. After depicting a culmination of these Tantric rites in the fiery meditations of Japan, Part Ill ends with an account of mundane events and practical affairs that pervaded and accompanied the Agnicayana project. The texts and translations of Part IV appropriately begin with sections from the Baudhayana Srautasutra, which is the most detailed and precise of the sutras, and probably the earliest. 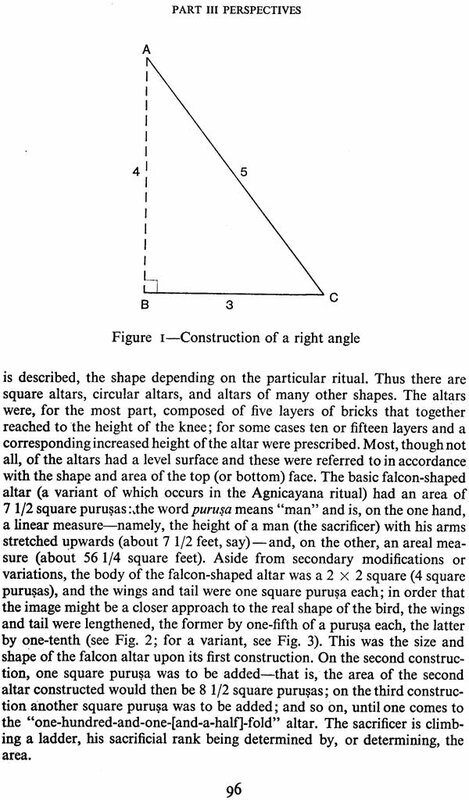 The material presented by Ikari and Arnold is the counterpart of the description in Part II, and makes possible a step-for-step comparison of the ritual as it was before 6oo B.C. with the 1975 performance. The contributions that follow supplement the Yajurvedic data with the Atiratra recitations from the Rgveda and the Agnicayana chants from the Samaveda. The content of the two volumes reflects a variety of disciplines. 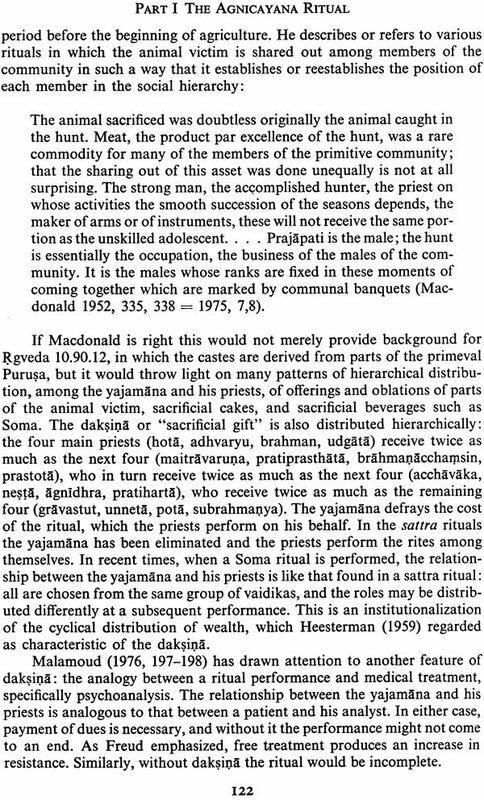 The emphasis in Part II may be characterized as anthropological or ethnographical; it represents Vedic fieldwork. Such fieldwork can be undertaken only by Sanskritists, but all too few have availed themselves of the opportunity. By contrast, the information provided in Pans III and IV is largely historical and philological. Though these contrasting approaches may seem incompatible, they are coherent from the Nambudiri. or indeed from the Indian, point of view. It is not surprising, therefore, that the descriptions offered in Parts II and 1V are often extremely similar in spite of their different orientation. Both descriptions differ in points of derail, but they exhibit the same structure and spirit. If the Nambudiris conceive of the ritual in the manner of the authors of the ancient manuals, it is not because they imitate the manuals; it is because they embody the same tradition. Part V of the second volume gives brief surveys of the twenty hours of film footage and the eighty hours of recordings with which we returned from India. The forty-five-minute film Altar of Fire, edited from these materials, presents primarily the Nambudiri point of view: it consists of a succession of episodes suggested by Cherumukku Vaidikan. The contents of the cassette tapes that accompany this book are described in the third section of Part V.
Collecting contributions from an international group of scholars has been challenging, time-consuming, and rewarding. Though the original style of the contributions has been largely retained, a certain amount of standardization has been done, and overlaps have been minimized. Since English is not the native tongue of most of the authors, nor of the editor, considerations of style have required much attention. In all these tasks I have been fortunate in having the assistance of my judicious coeditor, Pamela MacFarland. As in the case of the first volume, most of the papers have been typed by Ruth Suzuki with her customary, yet miraculous, speed. The burden of completing a variety of smaller tasks was much eased by support from the Department of South and Southeast Asian Studies and the Committee on Research of the University of California at Berkeley. The plates for this volume come from a greater variety of sources than was the case in the first volume. Acknowledgments are due to the Department of History and Archaeology, Karnatak University (for Plate 1); Professor G. R. Sharma (Plates 2-4); the Archaeological Survey of India (Plates 5-6); E. J. H. Mackay, Chanhu-Daro Excavations 1935-36 (Plate 7A); F. J. H. Mackay, Further Excavations at Mohenjo-Daro (Plate 7B); The Ashmolean Museum, Oxford (Plate 8); Krishnan Nair Studies, Shoranur (Plates 12-13); Shoren-in, Kyoto (Plate 14); Kuo Li-ying (Plates 15-17); and Adelaide de Menu (Plates 9-11, 18-23). The illustrations in the text and the numerous maps have again been drawn by Adrienne Morgan with meticulous care. Dr. W. M. Callewaert of the Department of Oriental Studies, Leuven, Belgium, has assisted with the map of Andhra Pradesh. Figures 28-31 are reproduced from The Creation of Mandalas: Rong tha blo bzang dam clos rgya mtsho, Volume 3. The materials presented in this second volume range far in time and space. Though all are reverberations of Agni and add dimensions to the Nambudiri Agni, do they place the Nambudiri tradition itself in a new perspective, and do they teach us anything else that is new? It would be tempting to claim that this extremely ancient tradition admirably fills the gap between the great literary traditions of mankind and many surviving traditions in preliterate societies that are now beginning to be studied. Attractive as this speculation is, 1 shall descend to a less lofty level of conjecture that is still replete with general questions. 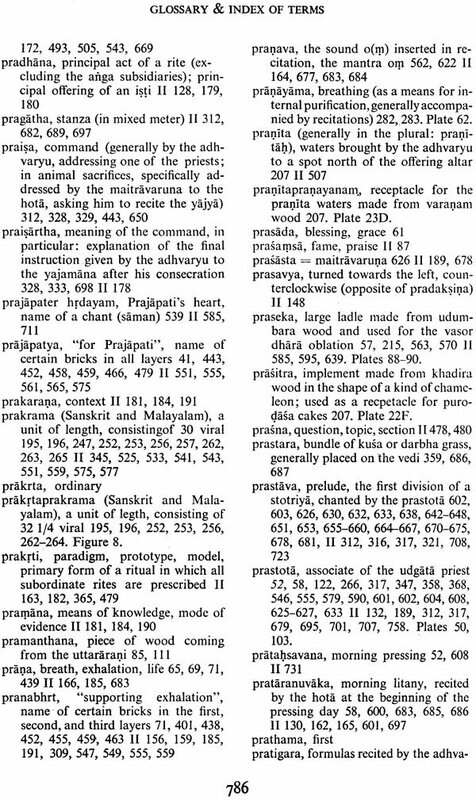 For example, how different is the Vedic religion of the Nambudiris from the original Vedic religion? How do Vedic and Hindu elements blend, mingle, or coexist in the Nambudiri tradition? And what light does this throw on the concepts of tradition and religion? 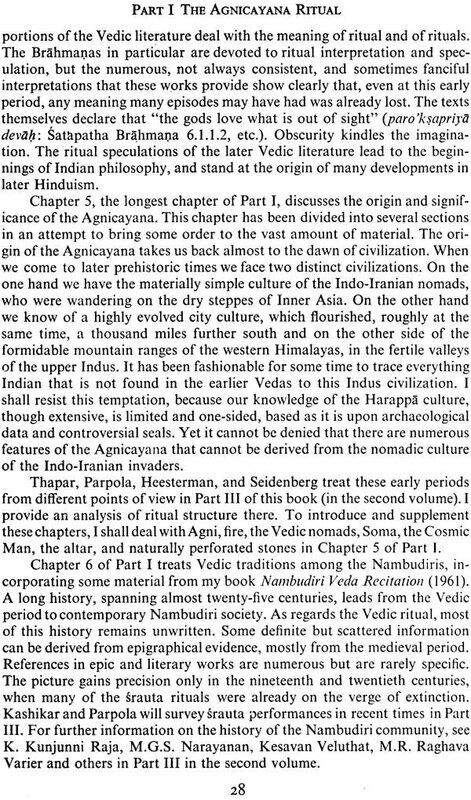 When answering the first question, one might begin with the stark contrast that becomes immediately apparent from a comparison of the section on Vedic nomads with that on the Nambudiri tradition in the first volume. While the Vedic nomads were aliens migrating into a new country where they came in contact with the remnants of an unfamiliar civilization, the Nambudiris are settled villagers and established country gentlemen occupying the highest ranks in their caste society. The Vedic religion, however, has remained the same in at least one respect. Agni is the same fire reinforced by mantras and oblations whose name continues to be familiar from chants and recitations. Agni is not a deity like Siva, Visnu, or Bhagavati, whose images are installed in temples. The Vedic religion of Agni and Soma is as nonanthropomorphic in the Nambudiri tradition as it was during the Vedic period. One reason for Agni's continuing identity is this nonanthropomorphism, which makes it possible for him or it to be carried in an earthen pot. It is in the nature of things that men and anthropomorphic deities are more readily susceptible to change than such nonanthropomorphic substances as Agni. How then are Vedic and Hindu elements related in the Nambudiri tradition? What students of religion in the West yearn for, of course, is Integration. When we ask the performers "Are you Vedic Indians or Hindus?" the answer is "We are Vaidika Nambudiris." From this we might conclude that things that seem to be incompatible to us are harmoniously one in the mysterious orient. But let us not get entangled too soon in our own confusions. To understand the Nambudiri answer adequately we have to move to a more sophisticated level of conceptual analysis. To begin with, we have to question those rubrics of religion we have come to use with such facile abandon. The labeling of elements as "Vedic" or "Hindu" may reflect a historical perspective, but it throws scant light on the synchronic relations between these elements, and has nothing to do with religion. 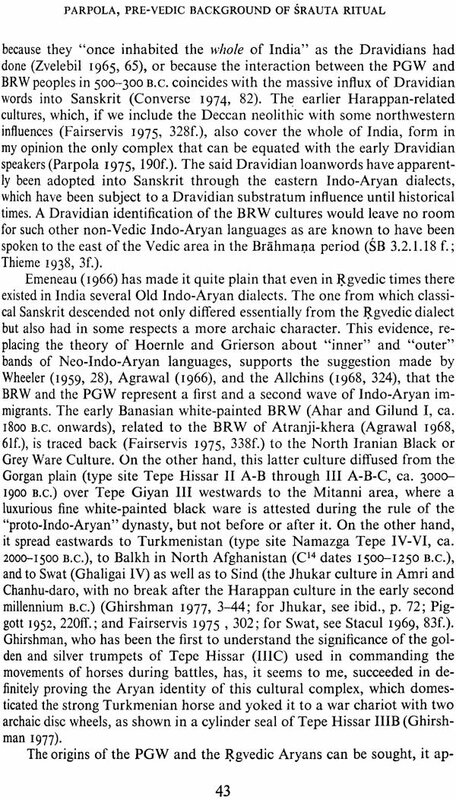 The same holds for the Harappan and Indo-European features of the Agnicayana itself, where such labeling is even more obviously historical. All such labels are imposed by scholars, laymen, and other outsiders. Their value lies in historical and comparative analysis; but we use them at our peril when we forget that they are inherently artificial. The concept of religion is a Western concept, and though its origin is Roman, it has been colored by its age-long associations with the monotheisms of the West. Western religion is pervaded by the notion of exclusive truth, and it claims a monopoly on truth. It is professed by "People of the Book," in the apt phrase the Koran uses to refer to Jews, Christians, and Muslims. Scholars and laymen persist in searching for such religions in Asia. In order to identify them, they seize upon labels from indigenous categories, rent from their original contexts. Thus there arises a host of religions: Vedic, Brahmanical, Hindu, Buddhist, Bonpo, Tantric, Taoist, Confucian, Shinto, etc. In India and in Asia generally, such groupings are not only uninteresting but uninformative and tinged with the unreal. What counts instead are ancestors and teachers--hence lineages, traditions, affiliations, cults, eligibility, initiation, and injunction-concepts with ritual rather than truth- functional overtones. These notions do not pertain to questions of truth, but to practical questions: What should the followers of a tradition do? This is precisely what makes such notions pertain to the domain of Karman. Hence orthopraxy, not orthodoxy, is the operative concept in India. The Veda, for example, is not a sacred book: its power lies in mantra; ad mantra is vidhi, that is, and injunction to Karman: "Speaking, it is of karman that they speak; and praising, it is Karman that they praise" (Brhad-Aranyaka-Upanisad 3.2.13). The structures of these Asian traditions are related and unrelated to Western patterns of religion, culture, thought, and society in a myriad ways. The term religion, however, has been applied in a clear and helpful manner only to Christianity, Judaism, and Islam. It is of limited applicability to Buddhism and to the bhakti cults of Saivism and Visnuism. Elsewhere it leads to a meaningless proliferation of problems. In the only intelligible sense of the term, there are no indigenous religions in India.